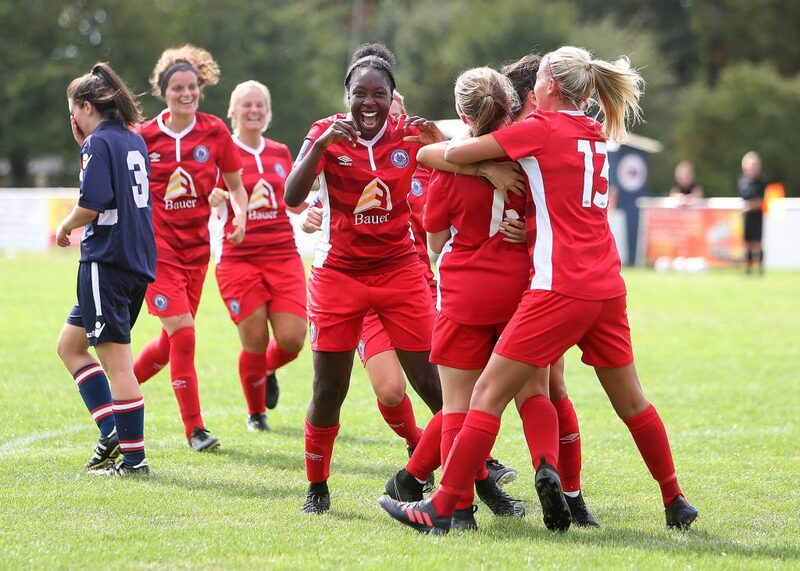 The ladies had a good start to the Season in their opening fixture against Denham on Sunday 19th August at The Den in the FA Women’s National League South East Division 1. 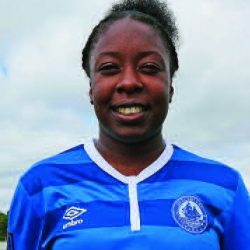 They dominated the game and came away with a 0-3 win, new signing Karissa Rodney was unlucky not to open the scoring after hitting the woodwork twice in the first 20 minutes. 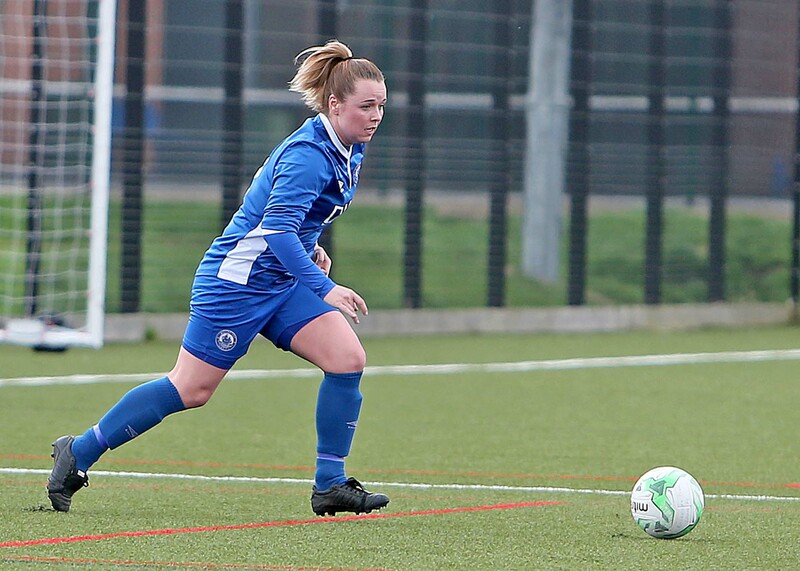 Billericay eventually hit the net in the 52nd minute Nicole Farmer played the ball out of defence, Rodney chased the ball into the box beating the defender and set the ball back into the path of Lucy Jones who neatly curled the ball past the keeper with the outside of her boot, this was well deserved as the team had maintained the pressure but Denham had denied them. 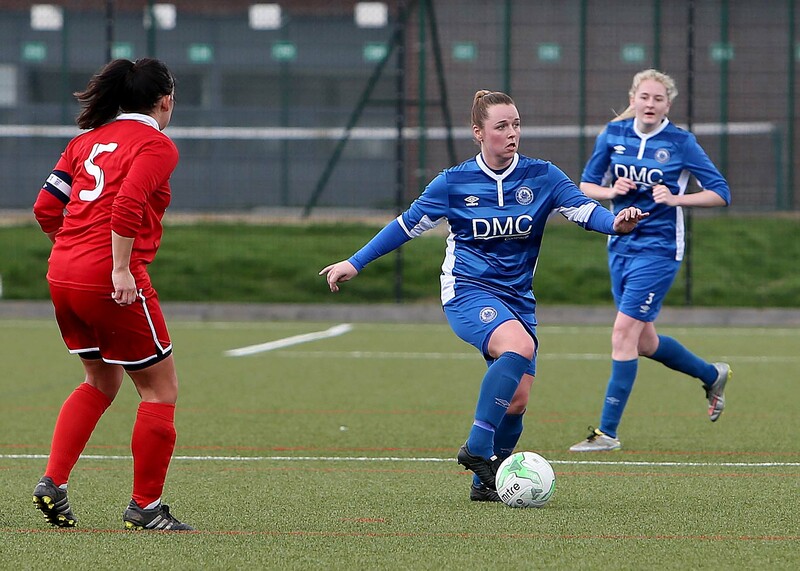 Billericay’s second came after a goal mouth scramble in the 71st minute, captain Lindsey Morgan having the final touch. 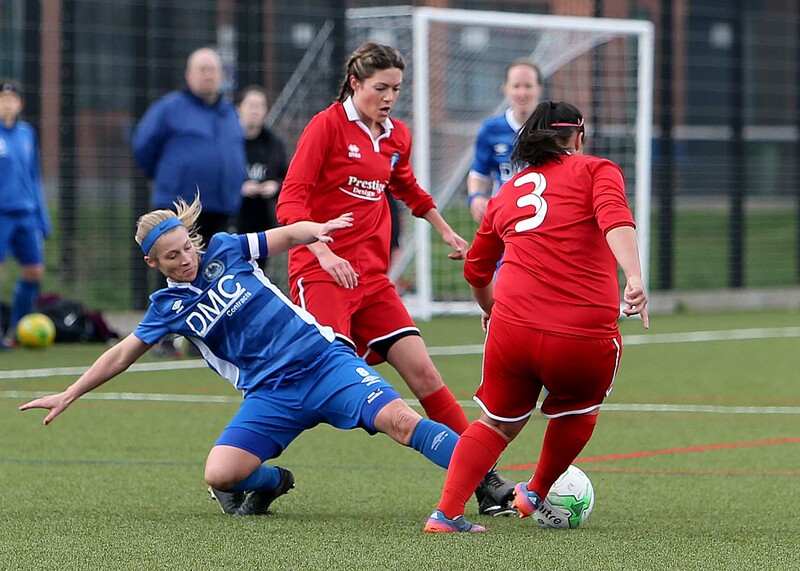 With minutes remaining new signing Sam Pittuck made it 3. 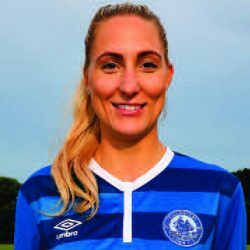 Kim Coster, spoke to us after the game and was pleased with the team’s performance, it could have been more but I will take the 3 points, we entertain Stevenage Ladies FC at the AGP Arena on Sunday 26th 2pm KO, Admission £3.00 Adults, U16 FOC. 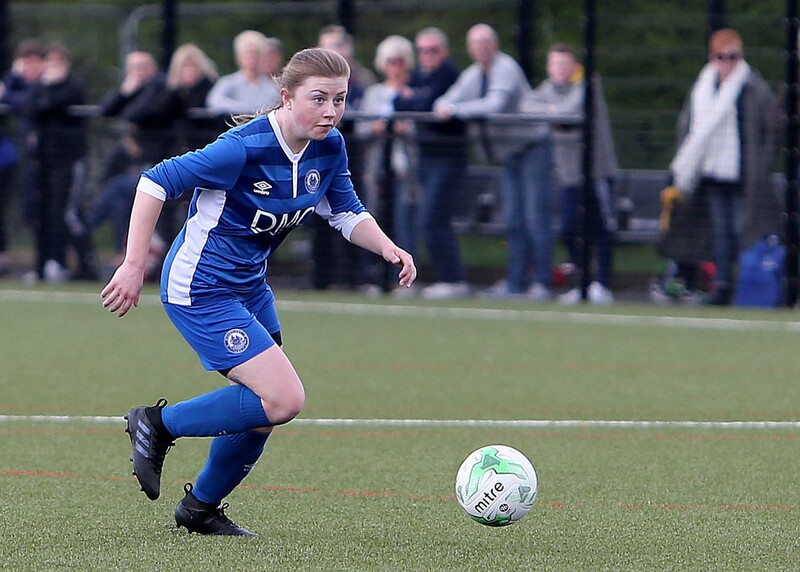 Squad Runnacles, Farmer, Revell, Lumley (Jiggens), Rushen (Piggott), Morgan (1), Blackie, Jones (1)(Armstrong), Pittuck (1), Rodney, Lancaster – subs not used Kelly, Baker. 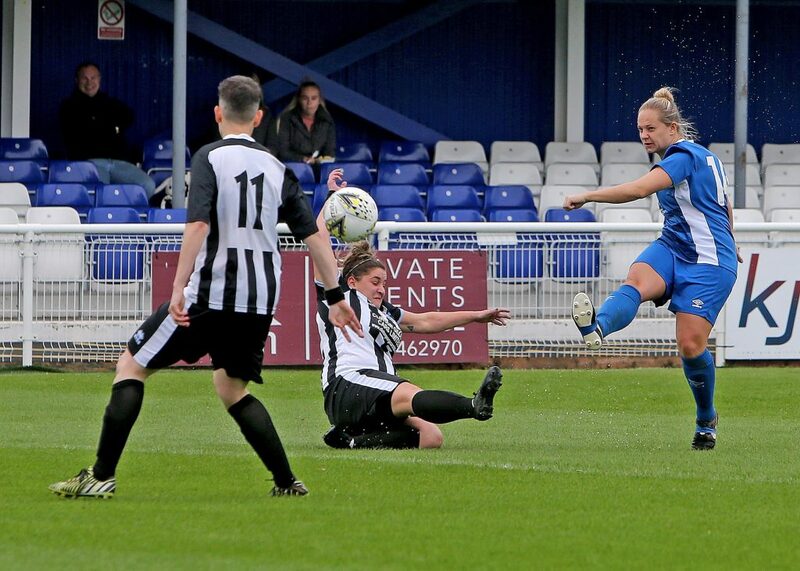 Billericay had a positive start and were rewarded with an early goal, Karissa Rodney’s shot was parried by the keeper, Sam Pittuck was first to react and slotted home from the back post on the 4th minute. The goal settled Billericay and they dominated the play. 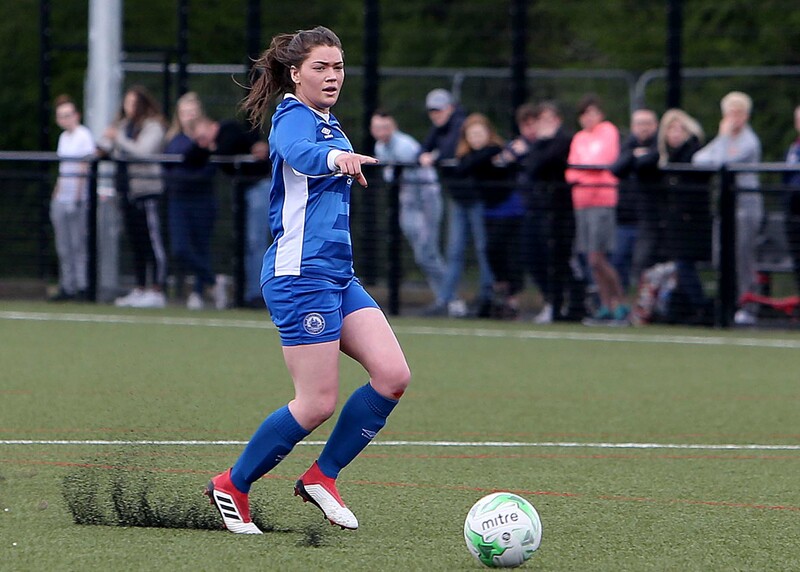 The blues second goal came from a Nicole Farmer interception on the half way line, her cross into the box was controlled by Rushen who slotted home on the 11th minute. 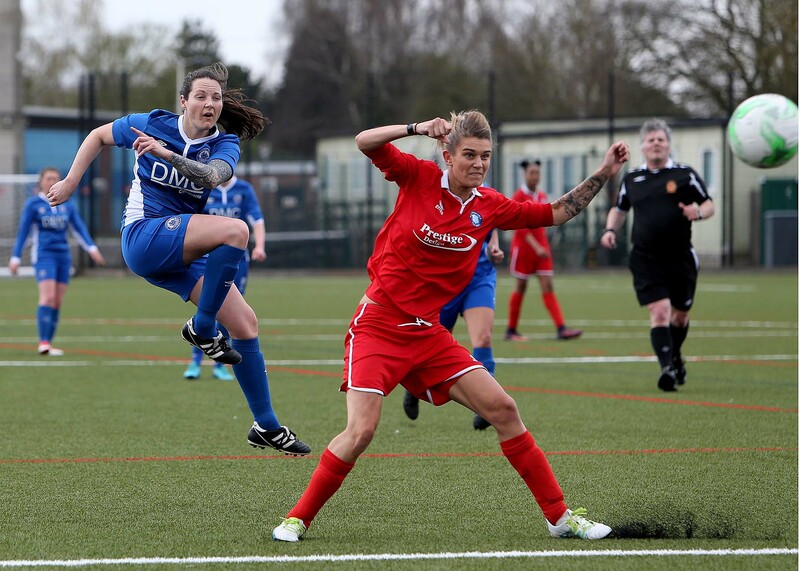 Billericay continued to create some great opportunities in front of goal but very unable to convert, this eventually allowed Stevenage to creep back into the game, a short ball back to the blues keeper allowed a Stevenage striker to beat the keeper making the half time score 2.1. 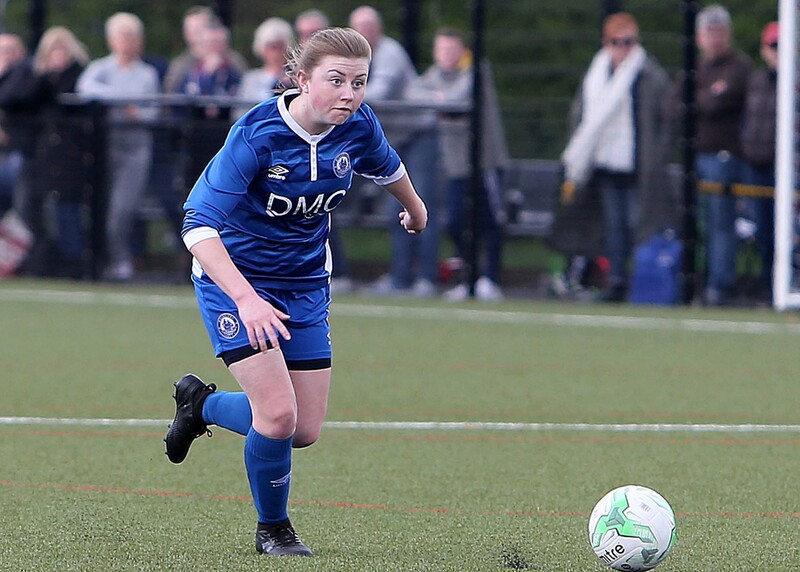 The blues started the second half putting some good passes together and continuing to create good chances, it was good to see both teams playing good football on a great surface. 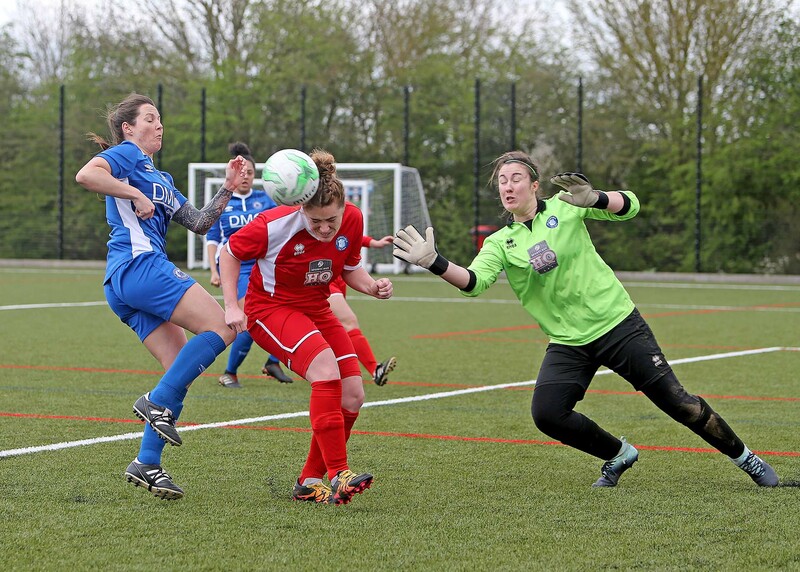 Good Blues pressure in the Stevenage box led to a free kick given for the goalkeeping handling a pass back. 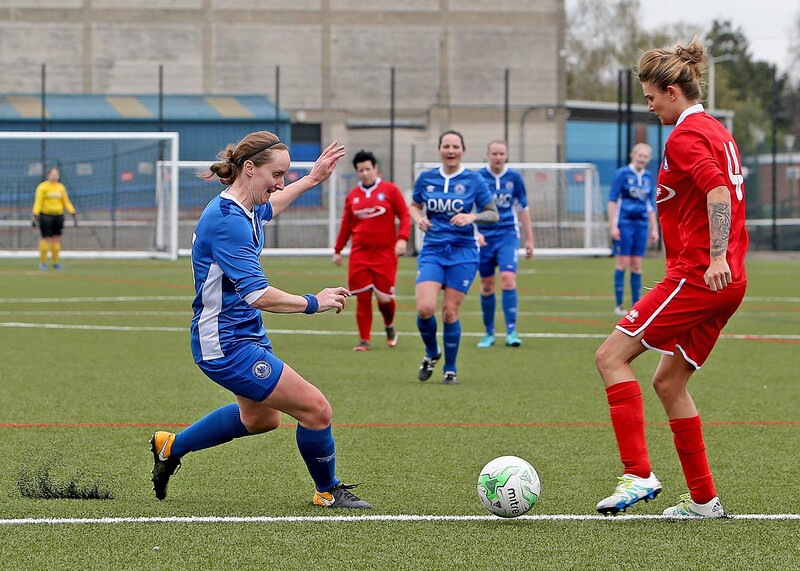 As Stevenage lined up on the goal line, Rushen took the free kick, Jay Blackie’s strike went through a gap in the visitor’s wall 3-1 on the 57th minute. 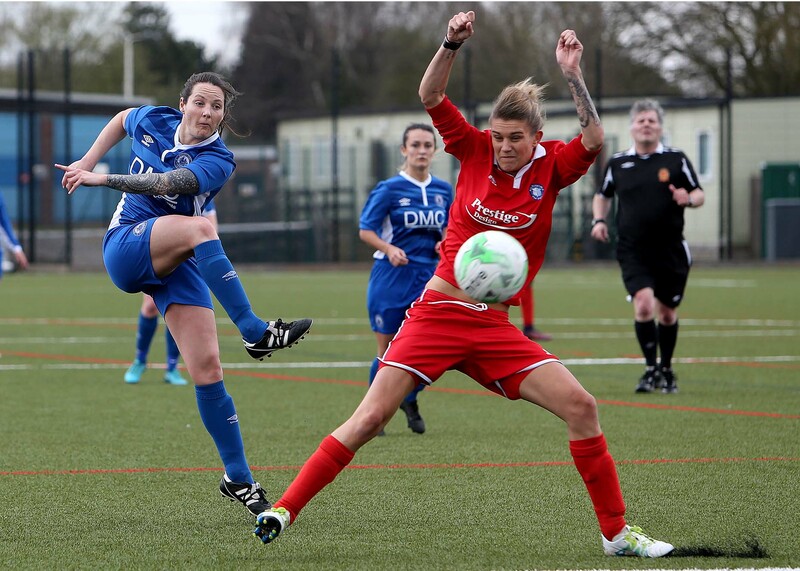 Stevenage were unable to break down a dominant blues midfield this allowed Billericay’s defenders to play out from the back. 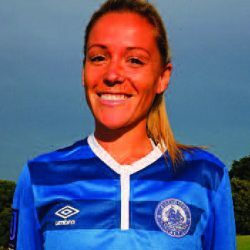 Danica Revell created Billericay’s 4th, a good cross saw a spectacular diving header from Blackie 4-1 on the 67th minute. Revell was again involved in Billericay’s 5th of the afternoon another cross into the box this time Pittock out jumped the covering defender and headed home on the 74th minute 5-1. 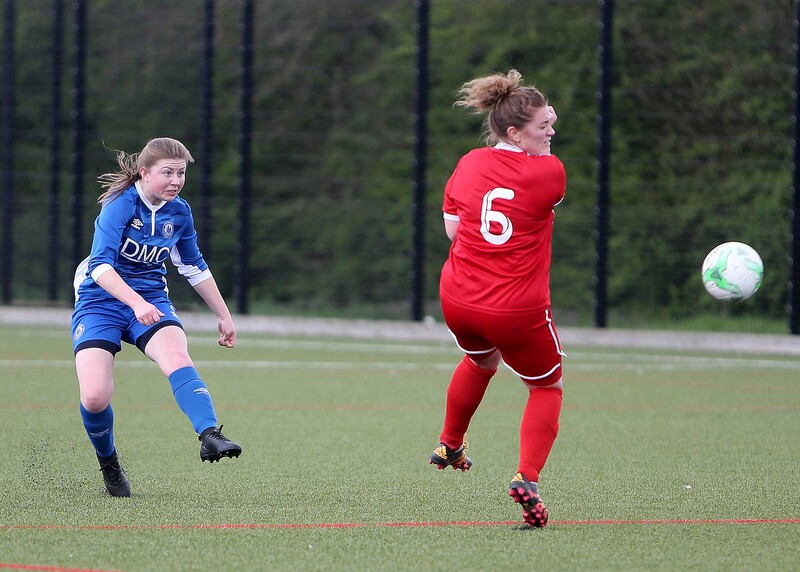 Hayley Piggott was unlucky not to get on the score when she stuck the visitors cross bar with virtually her first touch of the ball. 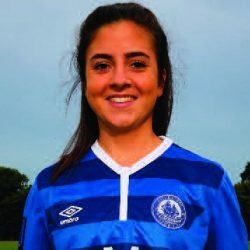 Billericay’s final goal came from good link up play in the box between Blackie and Pittuck, the ball was fed to Lucy Jones whose strike from 25 yards struck the back of the net. 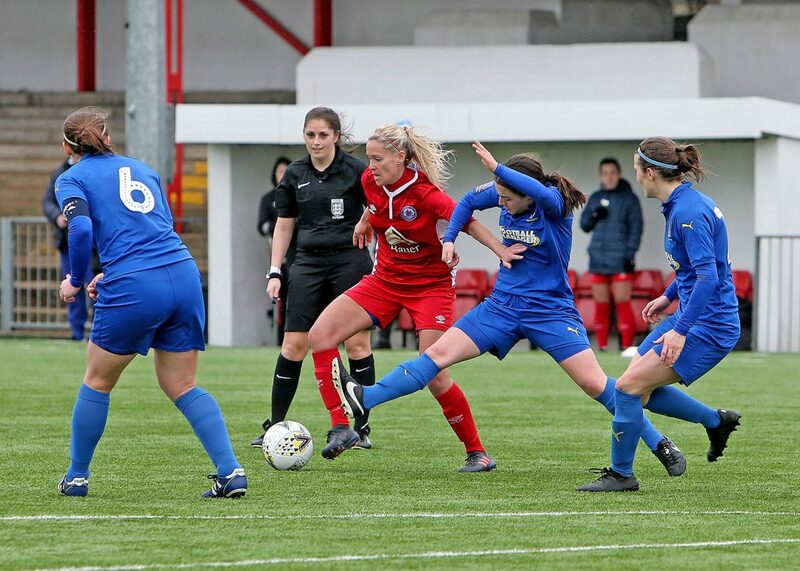 Kim Coster, great to get another 3 points and again it was a team effort, we know we can play better so will address in training, the players are playing with positivity and from that only good things can happen. 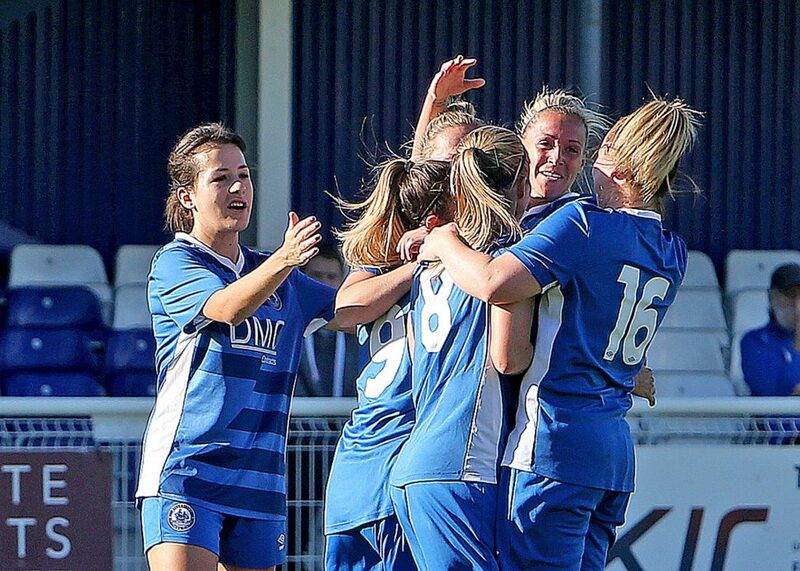 We go again next Sunday when we entertain Maidenhead Ladies in the League Cup at the AGP 2pm KO. 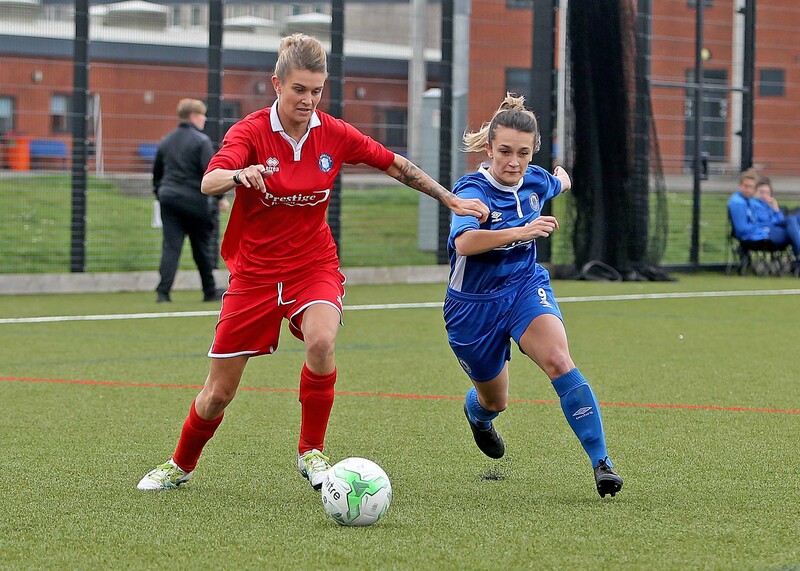 Ladies Entertained Maidenhead in the FA League Cup Qualifier at the AGP and run out 10-1 victors, it was good to see so many supporters at the game. 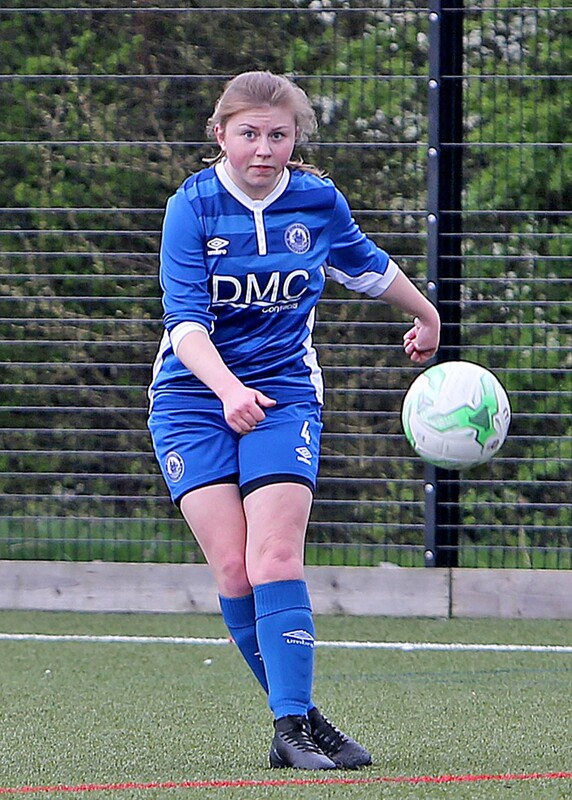 Billericay came out all guns blazing and were unlucky not to be 2 up within the first 5 minutes, the opening goal came on the 13th minute, a Lucy Jones throw to Zoe Rushen in the visitors box saw her lay the ball back to Jay Blackie whose strike took a deflection past the keeper 1-0. 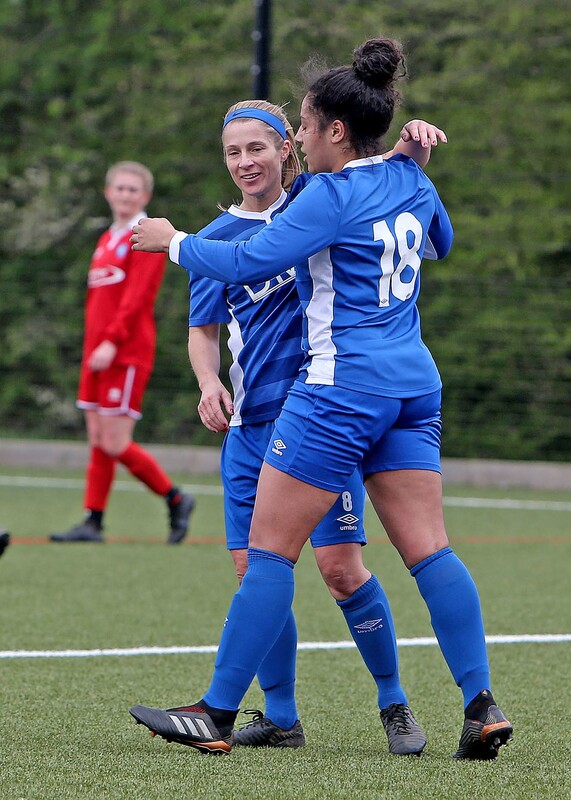 The blues second came from a good ball played into the box from Courtney Lumley, Karissa Rodney out jumped the keeper to slot home on the 22nd minute. 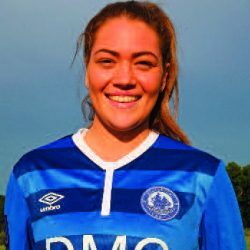 Rodney then became supplier when she played a ball through to Sam Pittuck who out classed the defence making it 3 on the 26th minute. 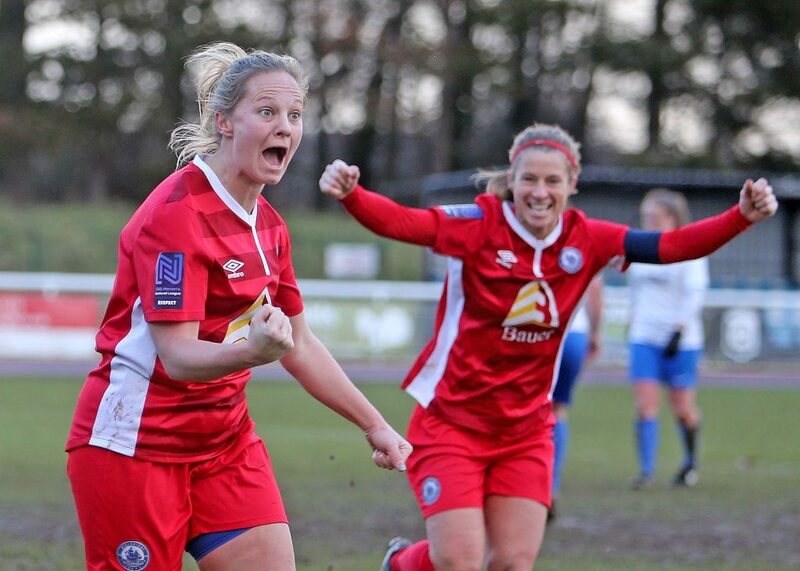 Pittuck scored her second on the 36th minute beating a number of Maidenhead players. 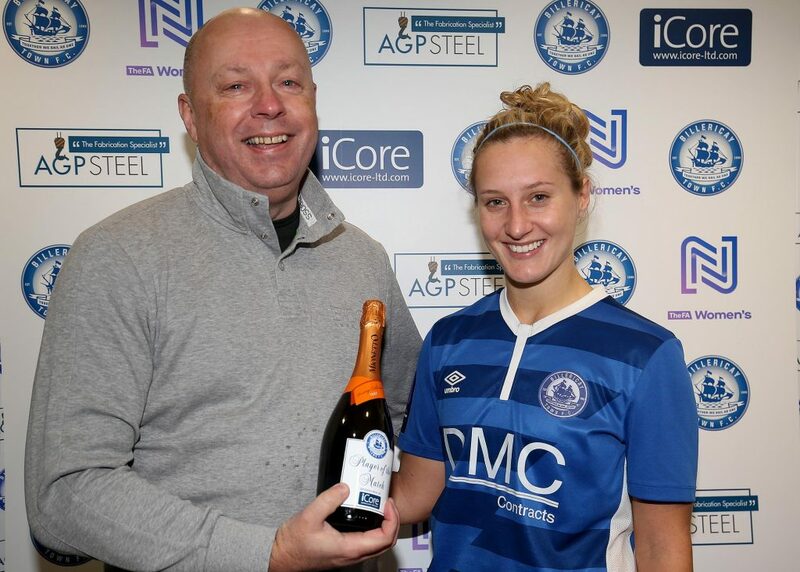 Maidenhead got on the score sheet via a blues defensive error, the striker finished it well on the 39th minute. 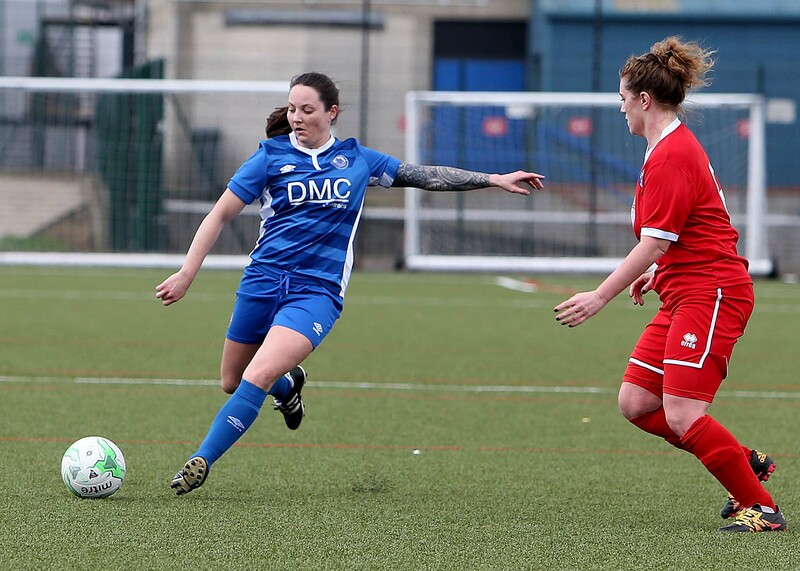 Normal service then resumed for the blues, Blackie scored her second just before half time, Danica Dougal played the ball out from defence to Pittuck who set the ball to Blackie who fierce strike beat the maidenhead keeper. 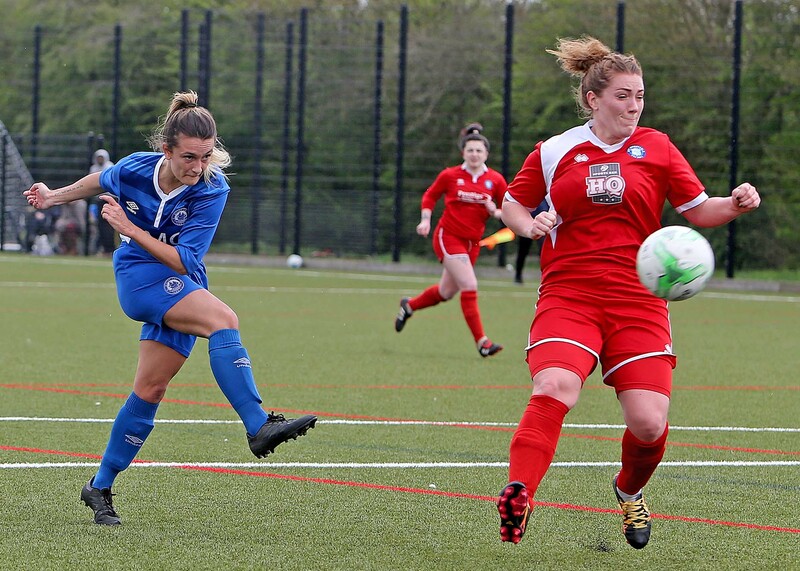 The second half saw the blues dominate possesion. Rodney made it six on the 51st minute. 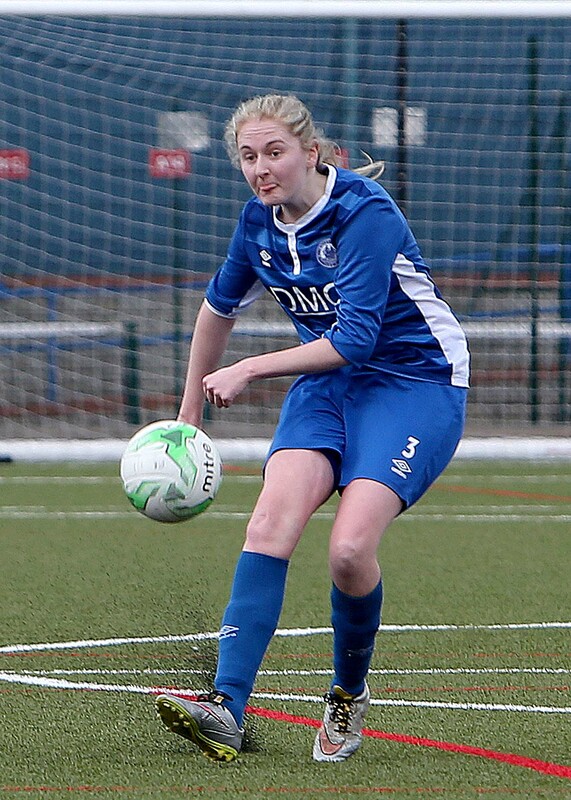 With goals coming thick and fast it was not long until the blues racked 7, Rushen turned supplier for Pittuck to complete her hattrick. Rushen then scored the eighth on the 60th, Rodney ninth on the 62nd . 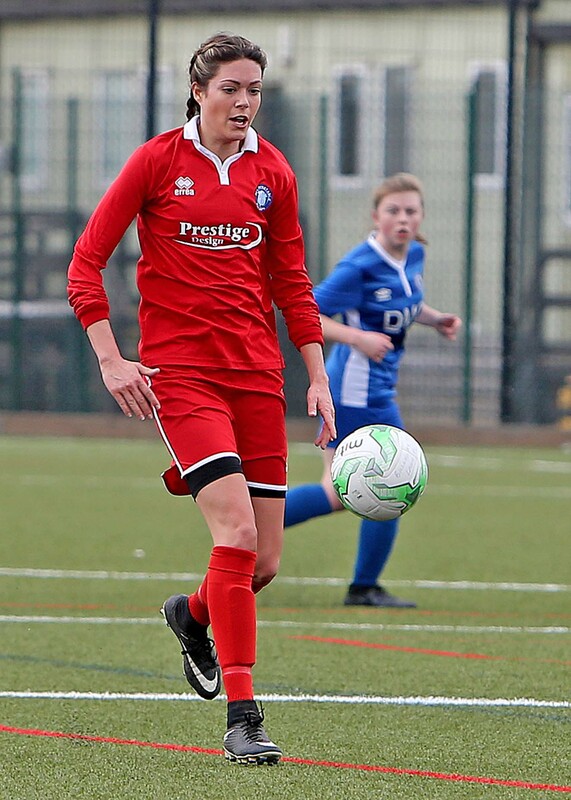 The final goal of the afternoon was via a penalty after Rushen was upended in the box, Hayley Piggott took the spot kick and beat the keeper on the 85th minute. 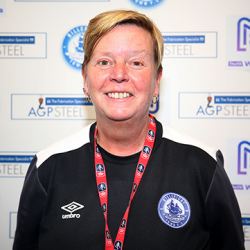 Manager Kim Coster was massively proud of the players today, stating there is still more to come from this team, on another day we could have realistically racked up 15 . 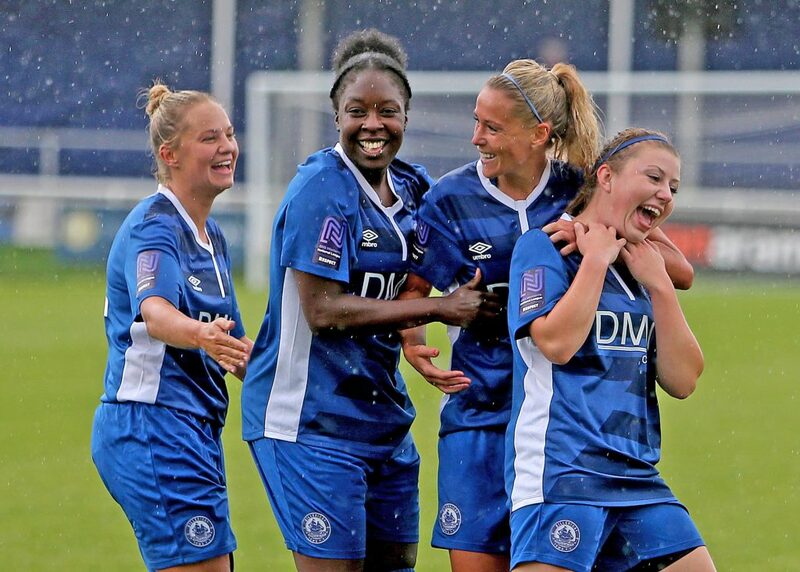 We now look forward to entertaining AFC Wimbledon in the league Sunday 9th at the AGP 2pm KO. 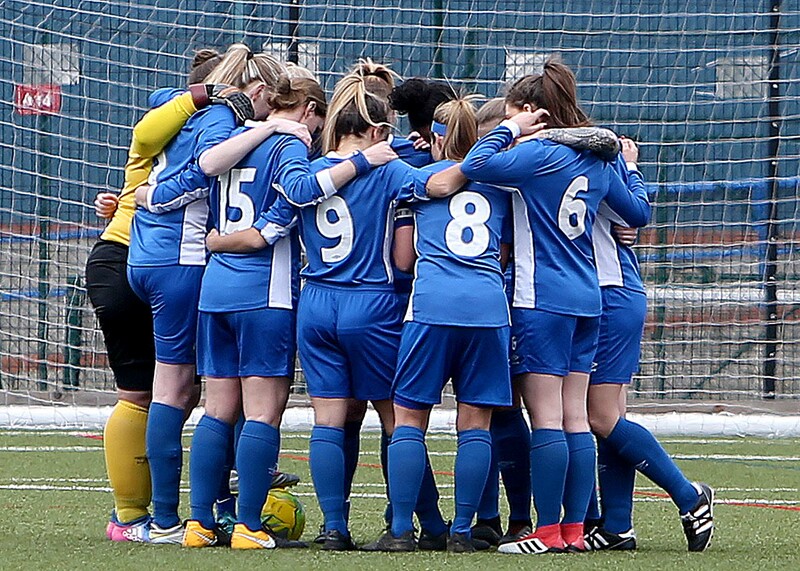 Team, Baker, Lumley, Jiggins, Dougal, Jones (Armstrong), Morgan, Blackie (2), Rushen (1), Lancaster, Pittuck (3)(Piggott)(1), Rodney (3)(Kelly), subs not used Nash, Smith. 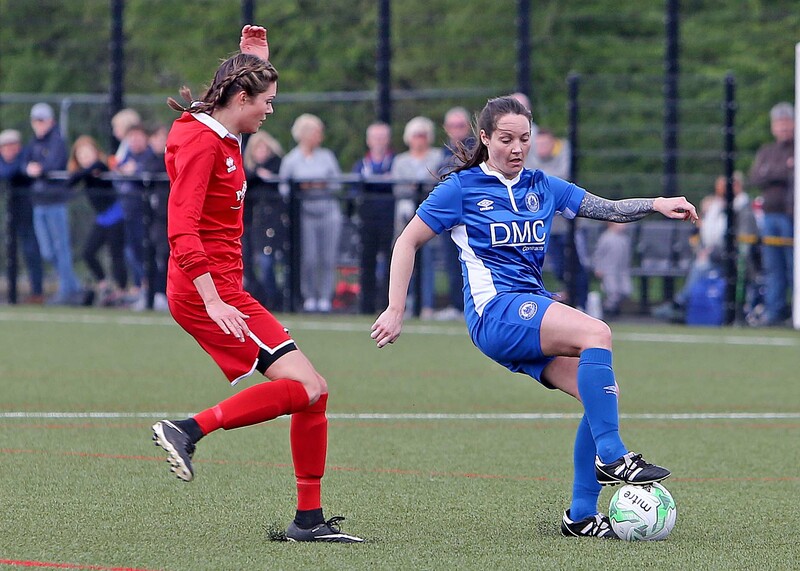 Billericay Town LFC entertained AFC Wimbledon at the AGP, this being their first visit to play the ladies in Essex and what a game it turned out to be, Billericay scored on the 26th minute a good ball played into the visitors box by Lucy Jones which Megan Jiggins smashed home. Both teams had chances in the half but failed to make them count. 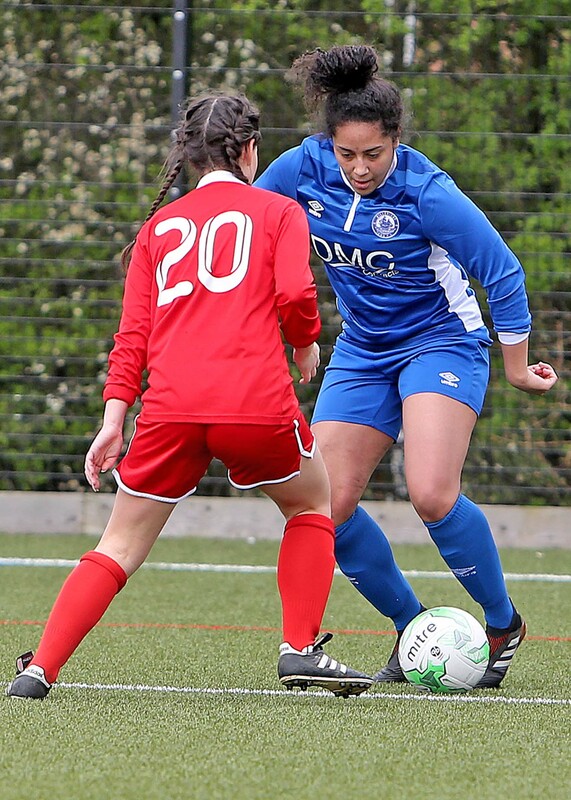 Start of second half saw Nikitta Runnacles replace Alex Baker in goal through ill health, Runnacles was tested early and did well with some good saves. 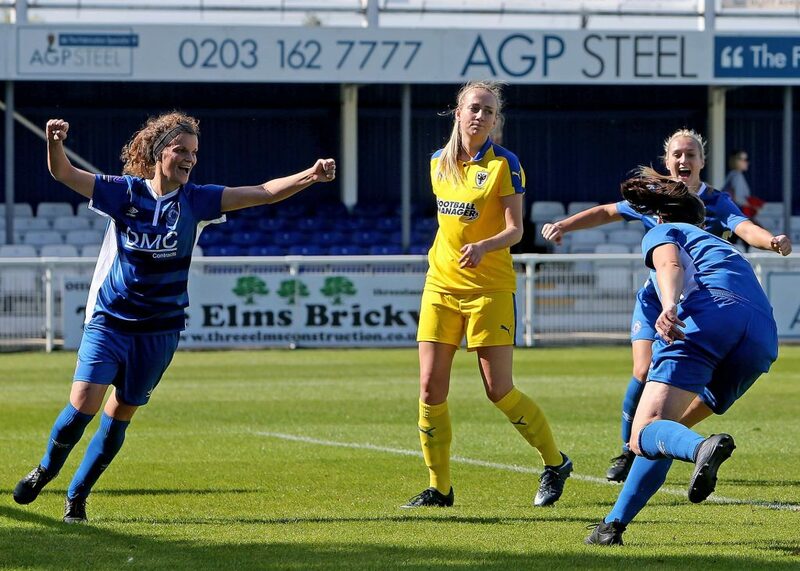 AFC Wimbledon were awarded a penalty after a Jiggins challenge was adjudged to be a foul, the strike smashed the cross bar and Billericay cleared the ball. Billericay thought they had made it 2 from a corner but the referee waved play on, would be good to see if there were any photos of the ball crossing the line. 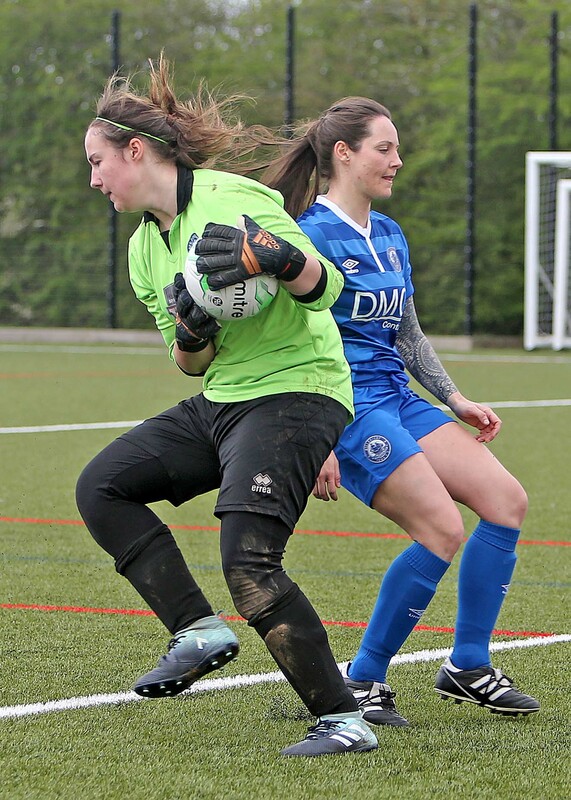 The last ten minutes saw a real battle take place and Sam Pittuck was unlucky as the visiting keeper pulled off 2 good saves. 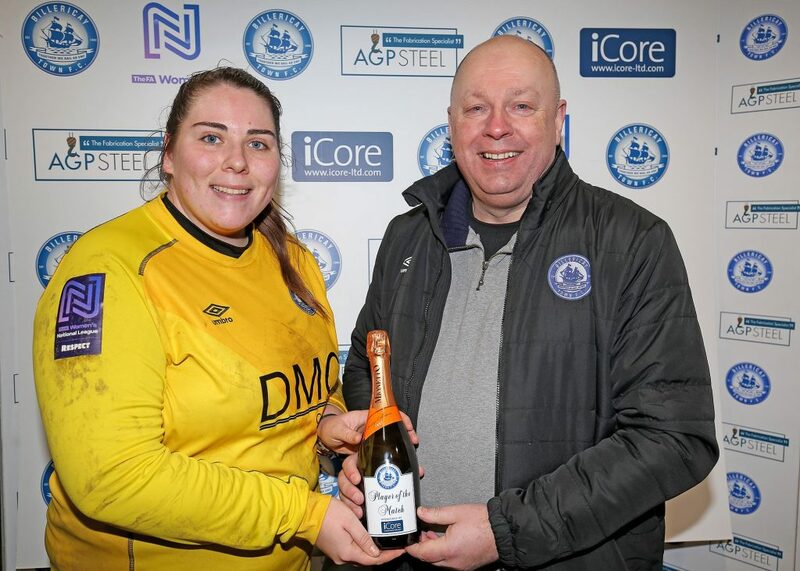 Kim Coster, this was an important 3 points against a well organised side, was great for the girls to keep a clean sheet both keepers played their part, the support was fantastic with attendance of 163 this really did help and thanks to all that came. Billericay started well and were unlucky not to get in front within the first 5 minutes, a good ball played into the box was controlled well by Jay Blackie whose shot went high. 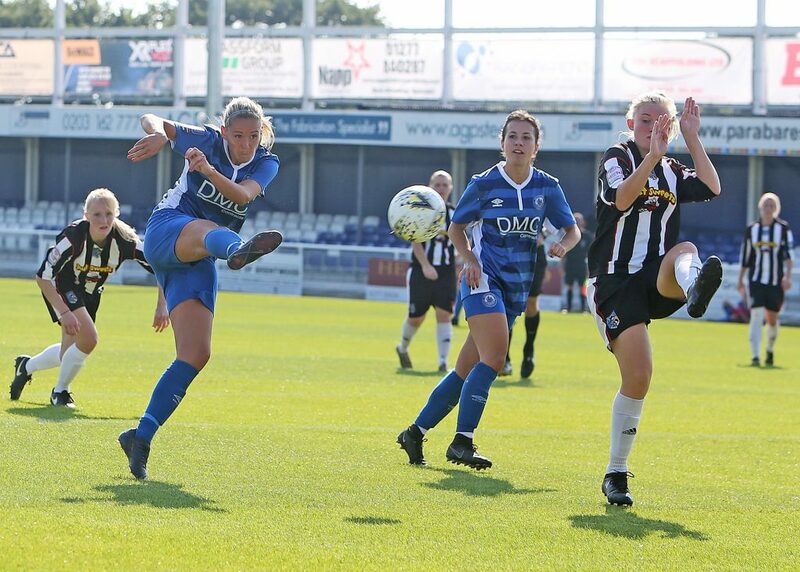 Billericay won the ball back quickly from the goal kick and Georgia Box making her first start of the season was brought down in the penalty area only to see the referee wave play on. 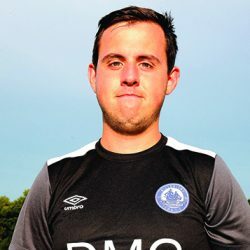 Leyton Orients response on the counter saw a shot ping off Billericay’s post, soon after Leyton won a corner, Nikkita Runnacle’s in goal for Billericay did well to punch the ball away only for a Leyton Player to respond quicker and headed the ball into the net 1-0 on the 9th minute. 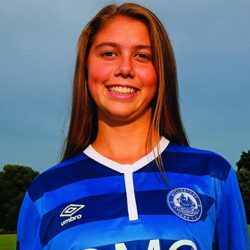 Both teams were playing good football but Billericay equalised on the 23rd minute via a long range shot from Zoe Rushen. 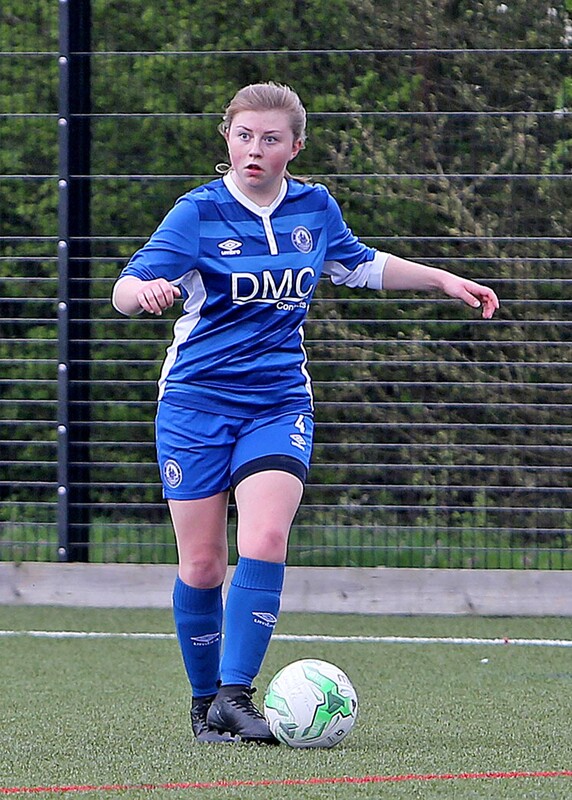 At the start of the second half Danica Dougal made a good break from defence and linked up well with Esme Lancaster whose shot skimmed off the cross bar, the lively Rushen took a corner and saw the ball ping off the cross bar Megan Jiggins follow up header went wide. 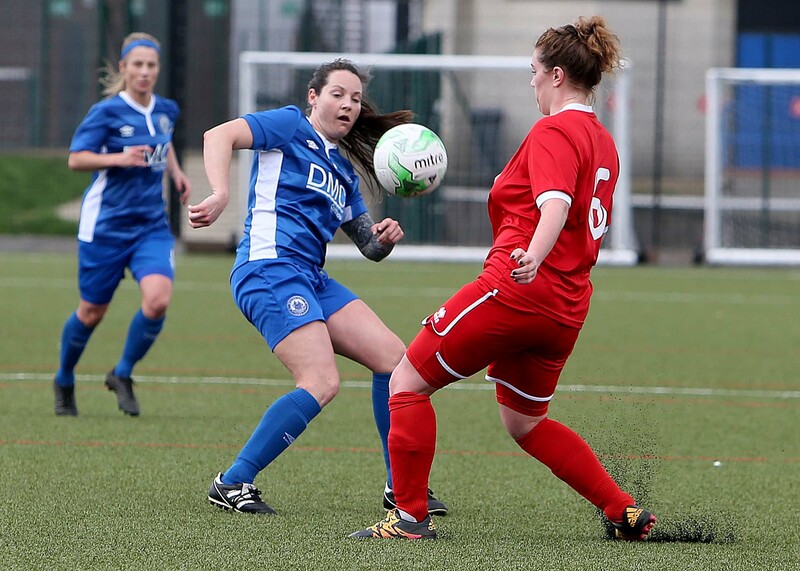 Billericay’s defence worked well to break down Orients attack, Courtney Lumley broke down the line and played a good ball to G Box whose touch took it past the approaching keeper, 1-2 on the 56th minute. 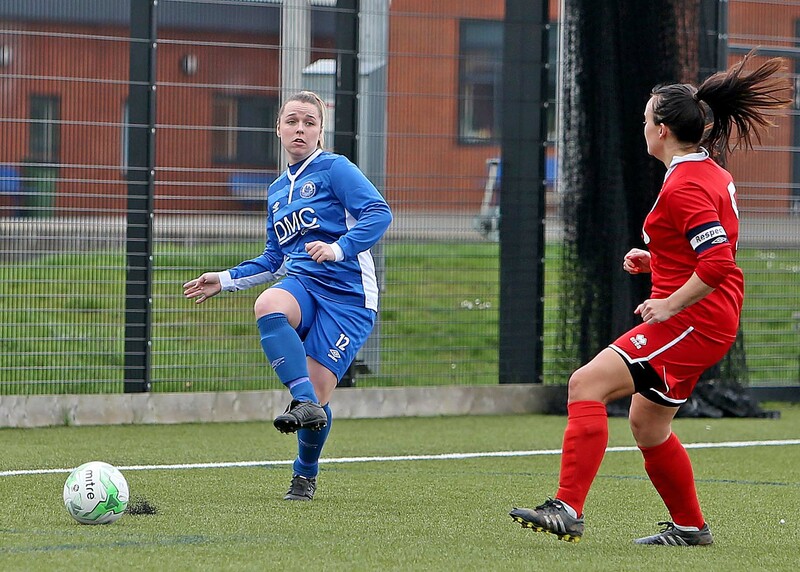 Lucy Jones was finding space down the left and was a constant threat to Orients defence. On the 70th she hit the cross bar. 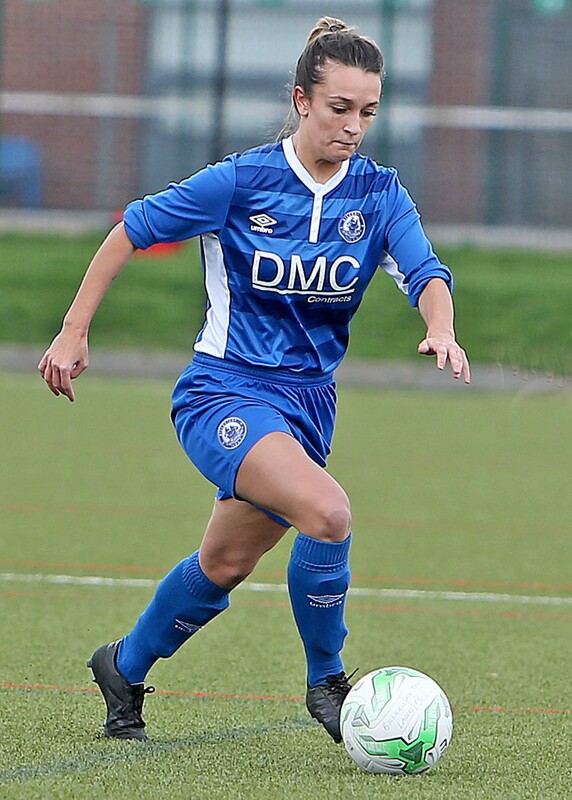 Billericay made some team changes around the 75th minute, Amy Nash replacing Box, Hayley Piggott replacing Sam Pittuck and Nicole Farmer replacing Dannica Dougal. 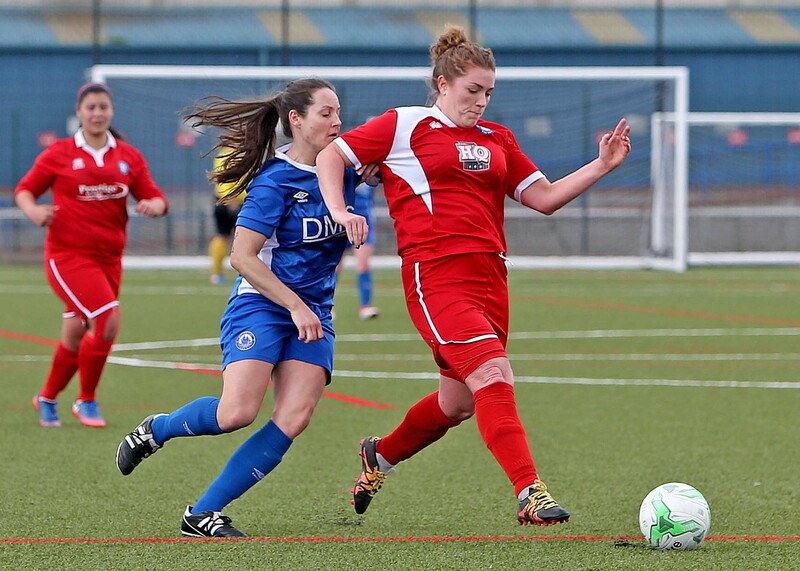 The 3 points were sealed on the 80th minute from a Rushen strike 3-1. 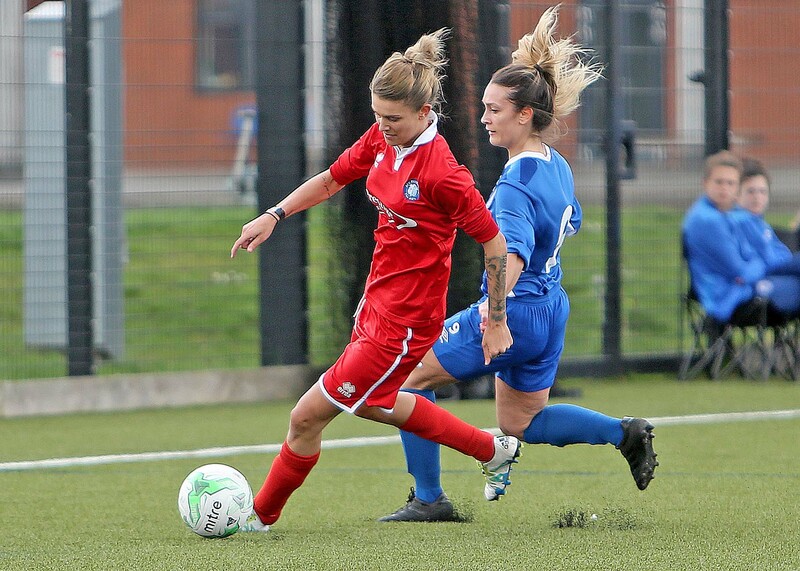 Kim Coster, the team worked hard for the win and the 3 points, I couldn’t be prouder of the whole squad after our start to the season. Team Runnacles, Jiggins, Dougal (Farmer), Lumley, Jones, Morgan, Blackie, Rushen (2), Lancaster, Box (1), Nash, Pittuck (Piggott), subs not used K. Smith, Butler. 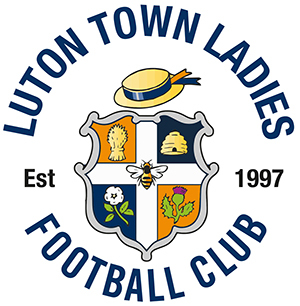 Billericay entertained Luton Ladies at the AGP on Sunday, this being their first visit to the stadium, Billericay had a good start with Danica Dougal and Lucy Jones testing the visiting keeper within the first 5 minutes, Luton were also creating chances, Nikitta Runnacle’s having to save from a long range shot. 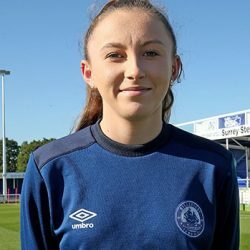 Billericay were playing good football and were busy around the box, Zoe Rushen played in Jay Blackie whose strike was well saved by the keeper. 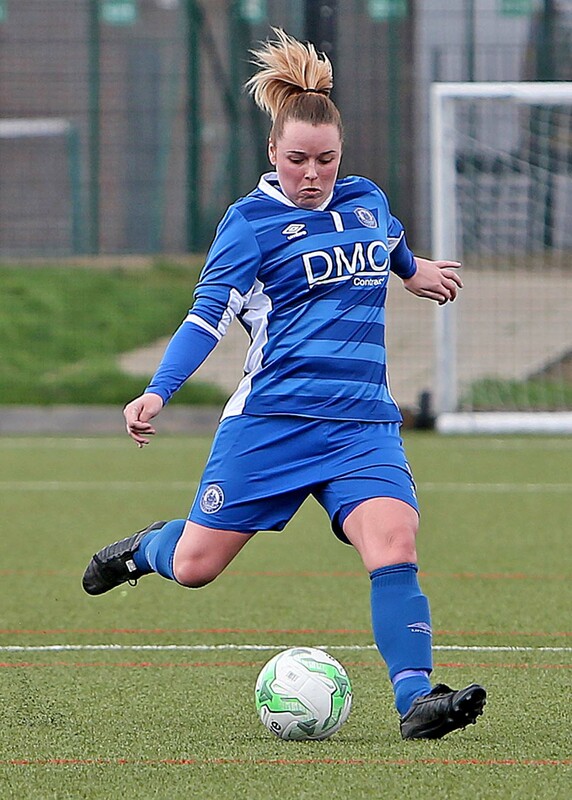 On the 18th minute Billericay’s Courtney Lumley put a cross into the box which was met by Lucy Jones at the far post, she half volleyed the ball into the goal 1-.0. 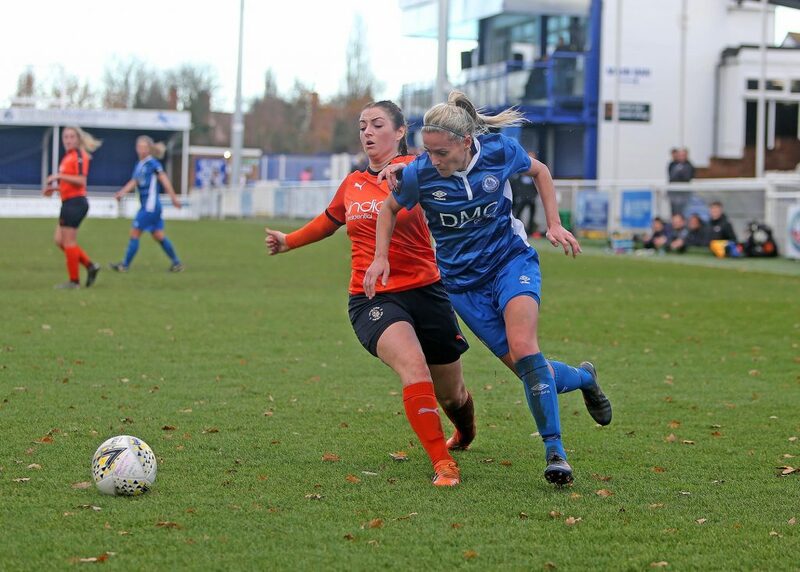 Luton hit the cross bar shortly after from a corner after a goal mouth flurry but Sam Pittock made it 2-0 on the 35th minute after Lindsey’s Morgan pass split the defence, Pittuck calmly took the ball past the keeper slotting the ball home. Second half was more evenly contested with the wood work being struck at both ends of the pitch, in the heat and through injury both teams made changes, Luton pulled a goal back of the 77th minute, this set up an exciting last 13 plus injury time minutes for the spectators, Luton were searching for the equaliser but Billericay managed the game securing all 3 points. 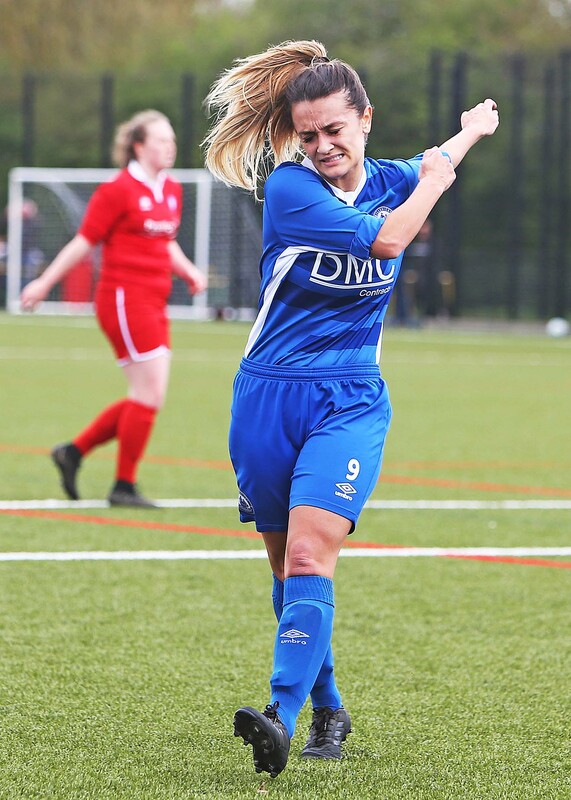 Kim Coster, The ladies had to work hard for this result and we are pleased to secure the 3 points, the team have played 3 games in 7 days as well as managing daytime jobs so massive praise, Luton had the fresher legs as their midweek fixture was cancelled. 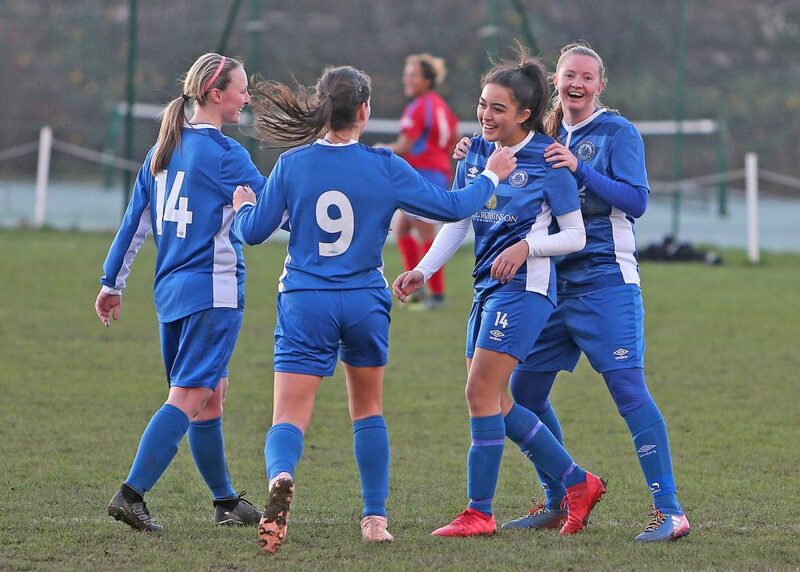 For us as a team there are many positives constant learning and striving to do better with each game and it is exciting to see how far we can go this season. 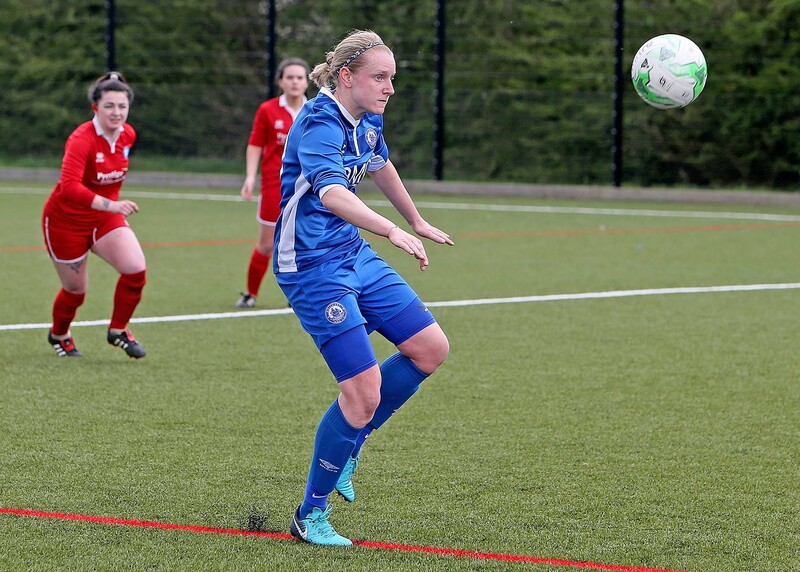 Team- Runnacles, Lumley, Dougal, Jiggins, Morgan, Blackie, Rushen, Lancaster (K.Smith), Jones (1), Pittuck(1)(Farmer), Box (Butler), subs not used Nash, Baker. 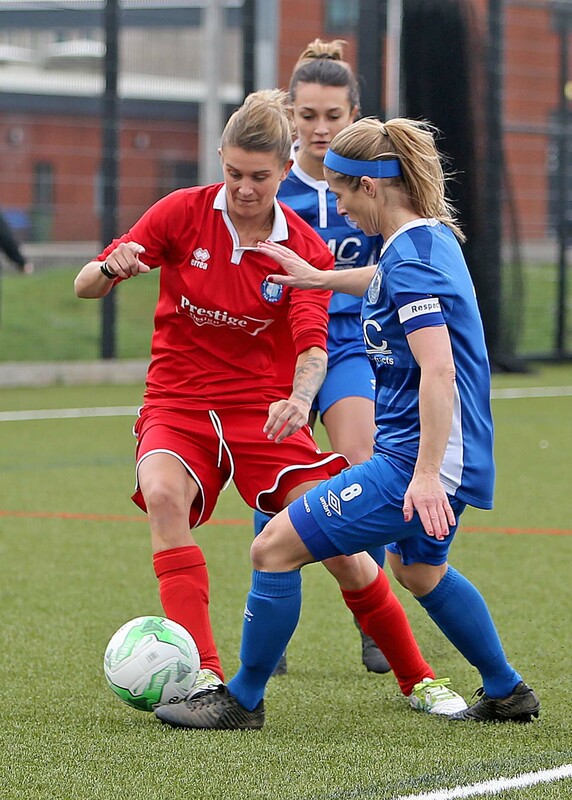 SSE Women’s FA Cup, 2nd RD Qualifier 23rd September 2018, Town LFC v Colney Heath Ladies. 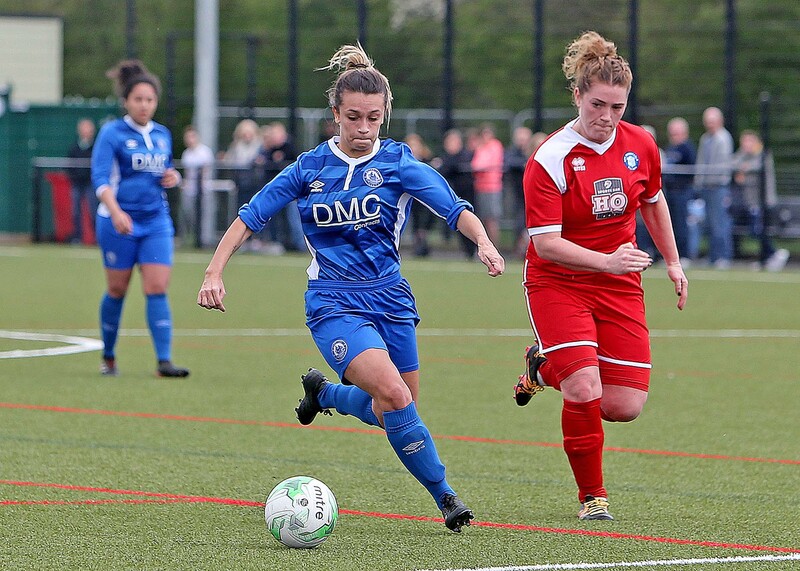 Billericay Town Ladies hosted Colney Heath Ladies at the AGP, last season both teams competed in the ERWFL, with Billericay taking the points at home and sharing the spoils at Colney’s ground. 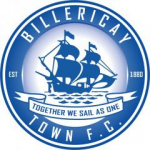 Billericay had the ideal start with an early goal on the 4th minute, Jay Blackie set up captain Lindsey Morgan to fire home past the keeper 1-0. 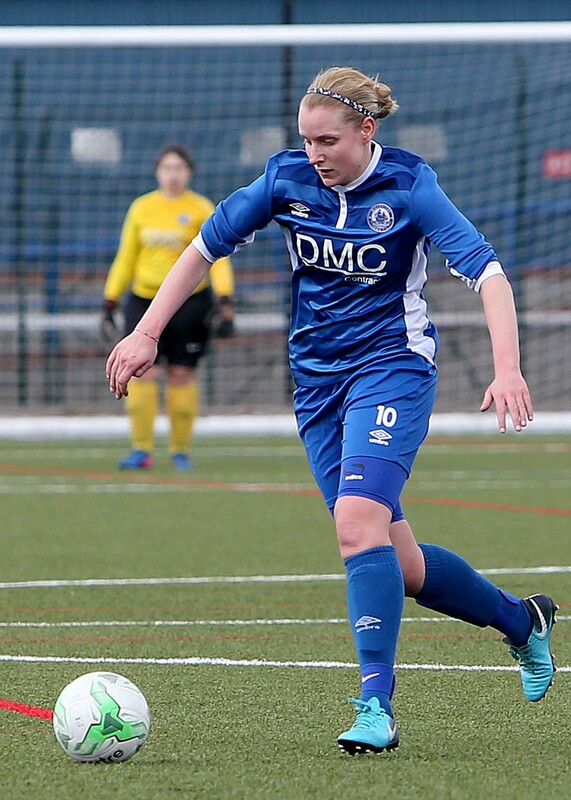 Billericay won a corner on the 14th minute, Zoe Rushen played to Lucy Jones whose cross into the box was met well by Megan Jiggon’s she outjumped the defence and headed into the net 2-0. 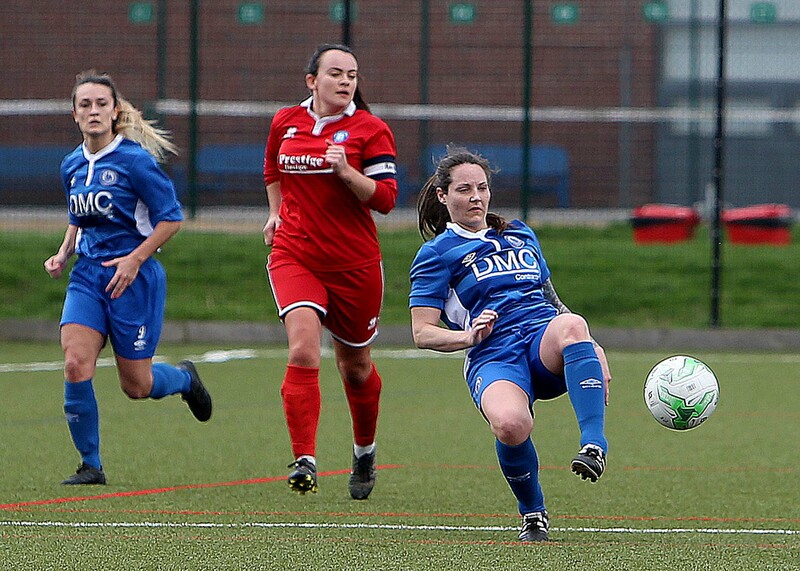 Colney Heath battled well and stopped Billericay on the attack, the first half finished 2-0. 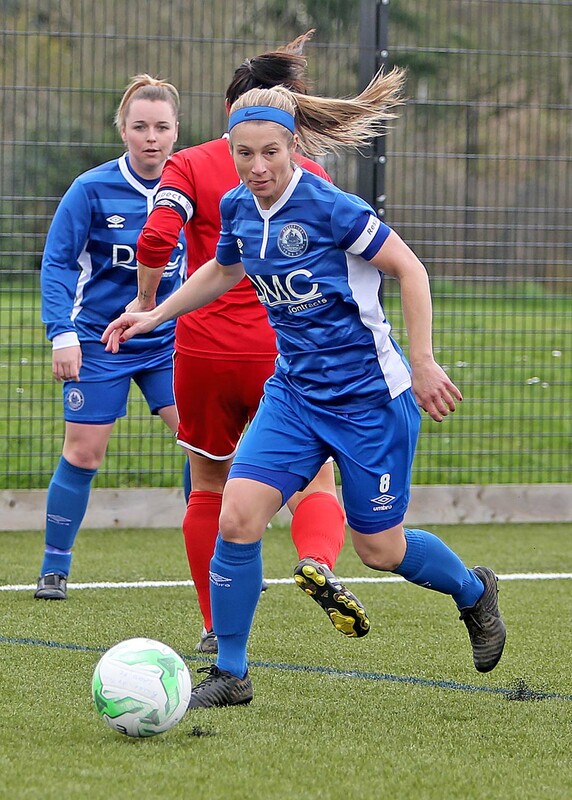 Second half both teams enjoyed good spells but Billericay upped the tempo after Rushen headed home from a corner 3-0 on the 60th , Nicole Farmer made it 4 on the 63nd minute a low drilled shot beating the keeper, Georgia Box got the assist for the 5th slotting Rushen in on the 73rd minute. 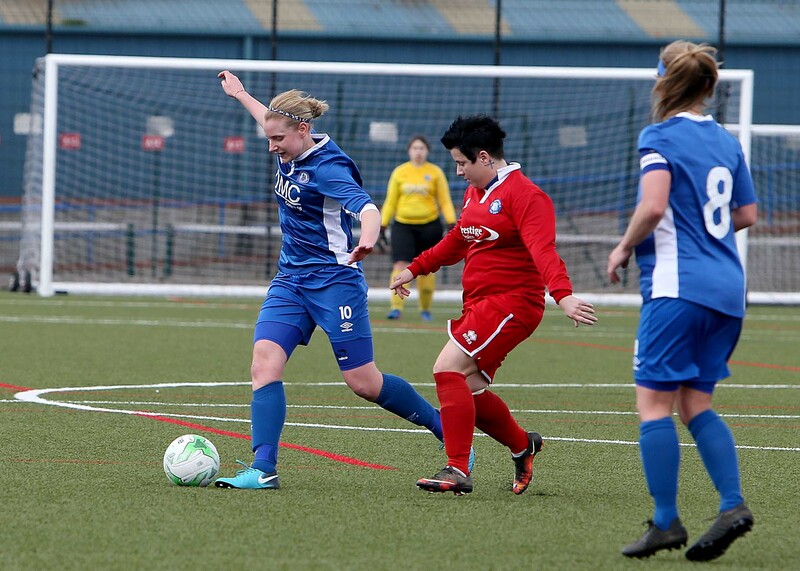 Hard working Blackie scored the 7th on the 80th after a good cross into the box, she headed the ball over the keeper. 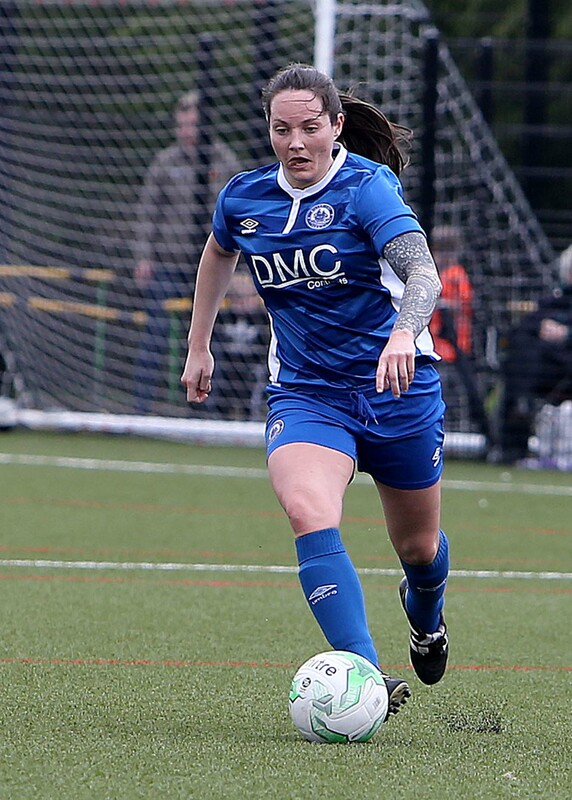 Credit to Colney who pulled one back on the 82nd, Billericay were quick to respond and made it 8 Nancy Butler’s strike was parried into the path of Blackie who side footed the ball into the empty net on the 85th, Danica Dougal made it 9 on the 88th minute from a corner, drilling the ball home from the far post. 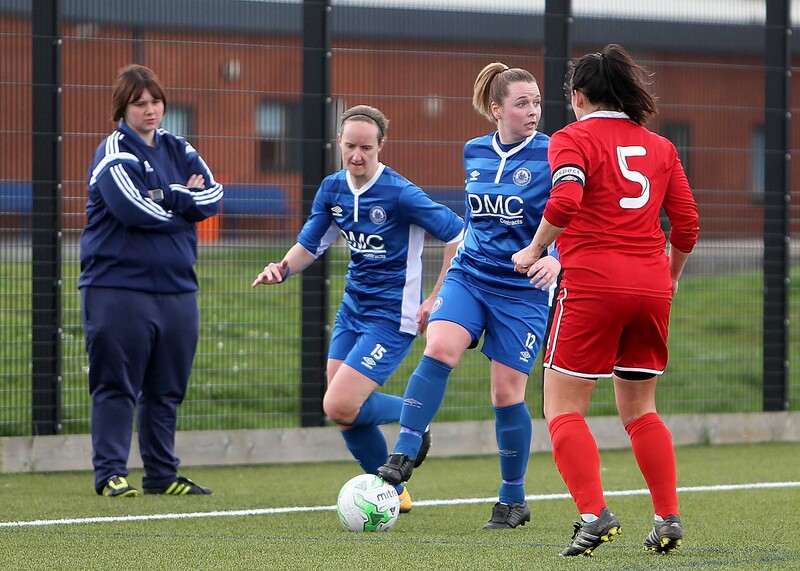 Kim Coster, a convincing win against a good team, much credit to Colney who didn’t give up our players finished their chances well. 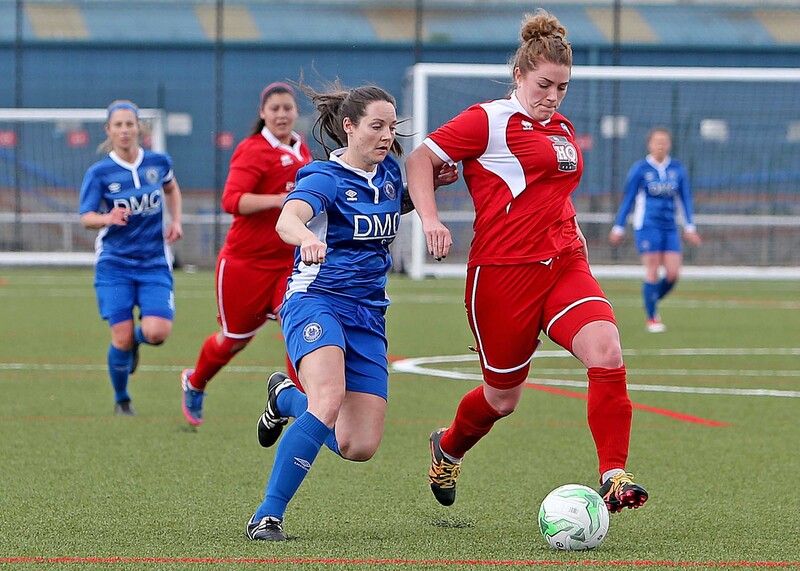 We are back in league action on the road away to Old Actonian’s on Sunday 30th September. 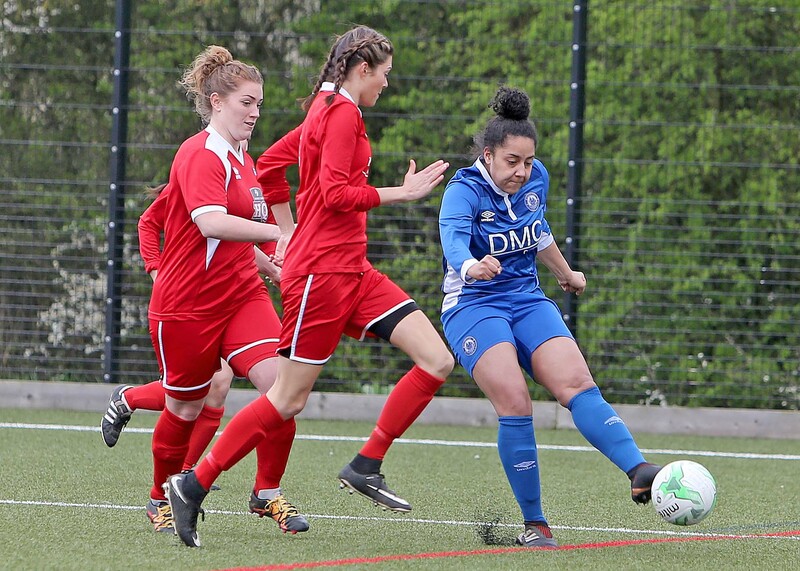 Billericay travelled to the new Middlesex FA Headquarters to play Actonian’s and extended their unbeaten run to 8 games albeit having to settle for a share of the spoils. 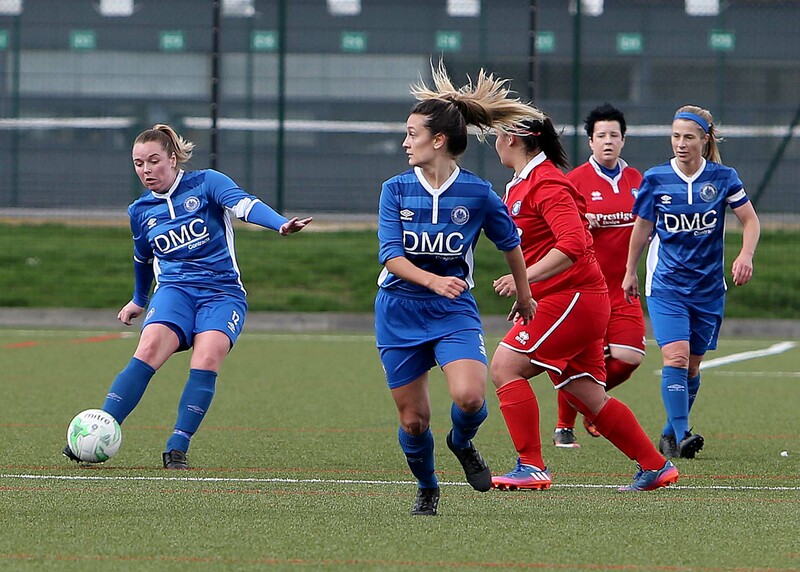 The home team opened the scoring after 4 minutes but the blues replied shortly after with a well taken Header by Jay Blackie. 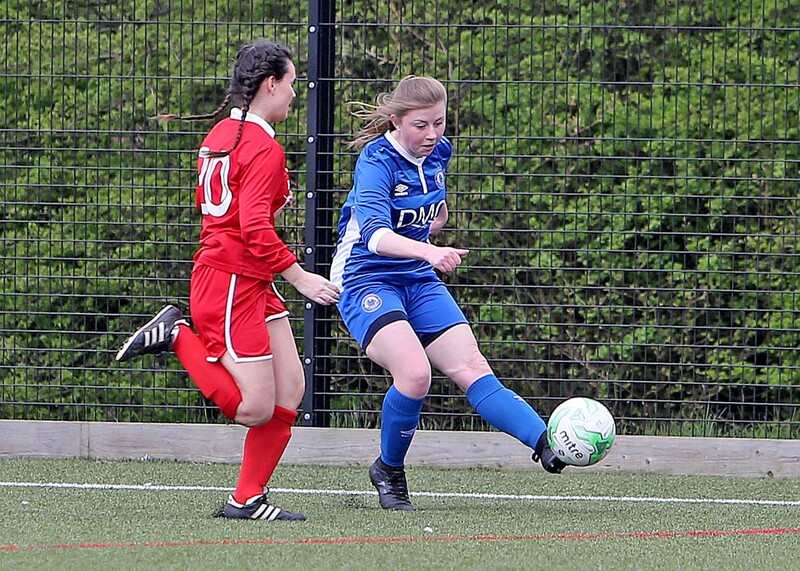 Zoe Rushen was unlucky not to put the blues ahead after her shot hit the bar in the 16th minute. 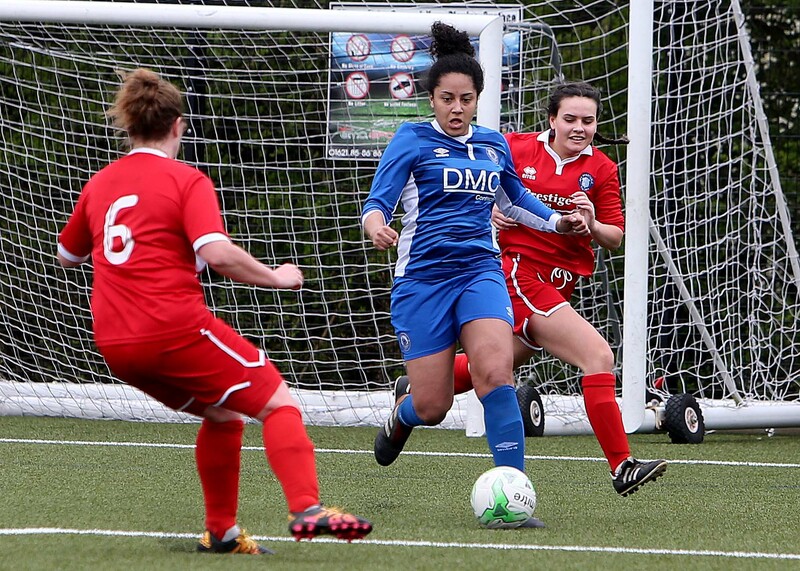 Rushen then turned provider playing a great ball to Georgia box who slotted home to make the score 2-1 to the blues after 20 minutes. 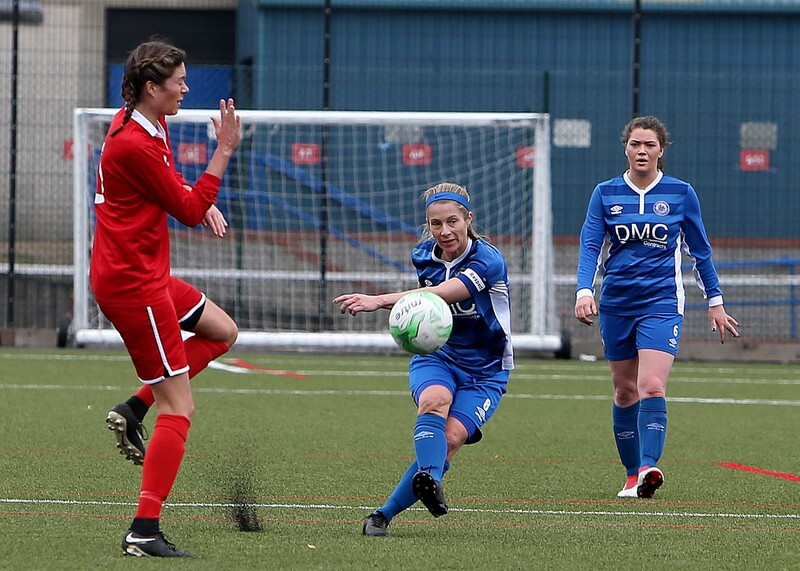 The blues were on a roll, 2 minutes later a corner was converted by Jay Blackie to give the blues a two goal cushion. 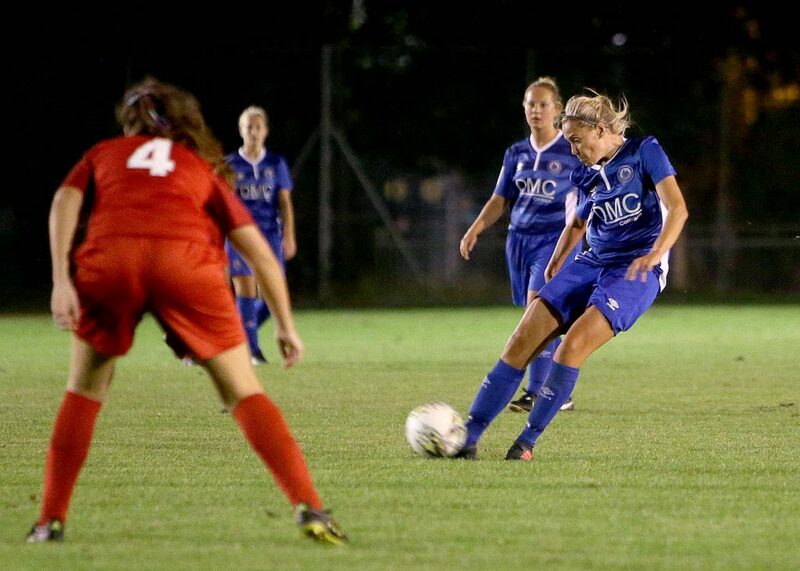 After 32 minutes the home side clawed one back making the half-time score 2-3. 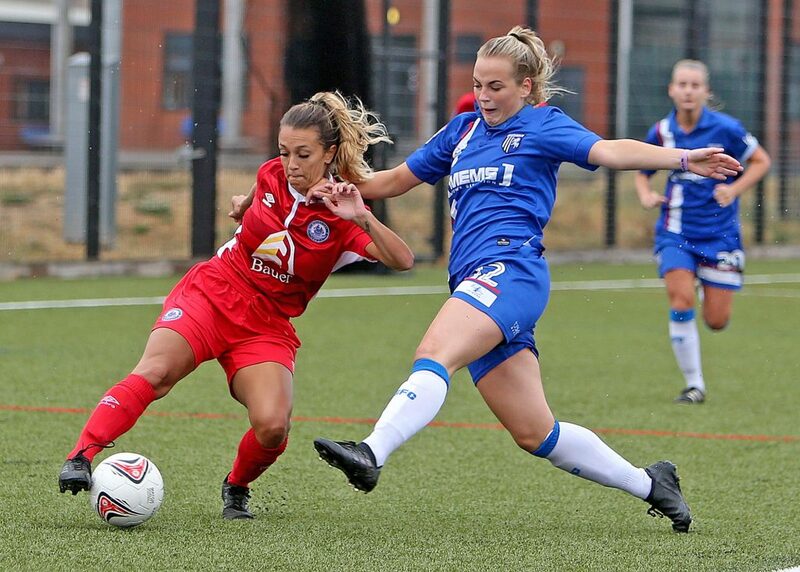 Both teams came out determined in the second half but it was a blues that scored first after 51 minutes Georgia box netting her second of the match. 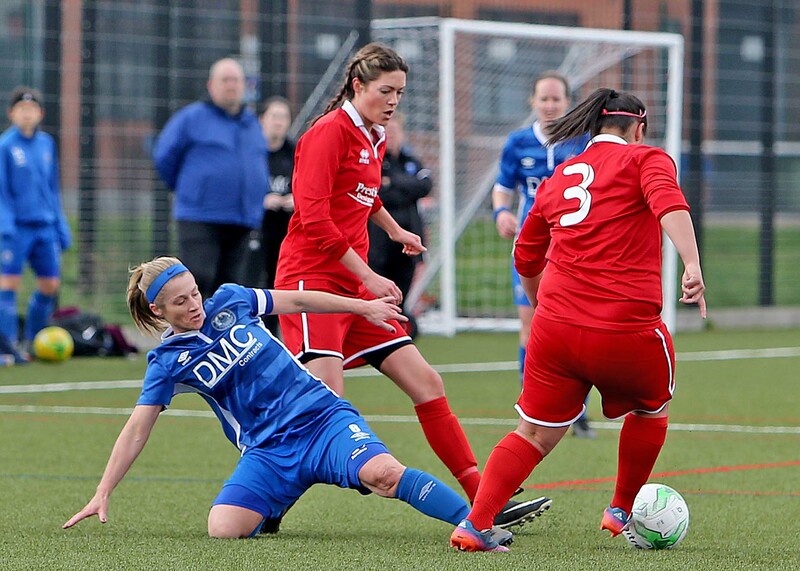 The home side never gave up and were awarded their third goal in the 57th minute. 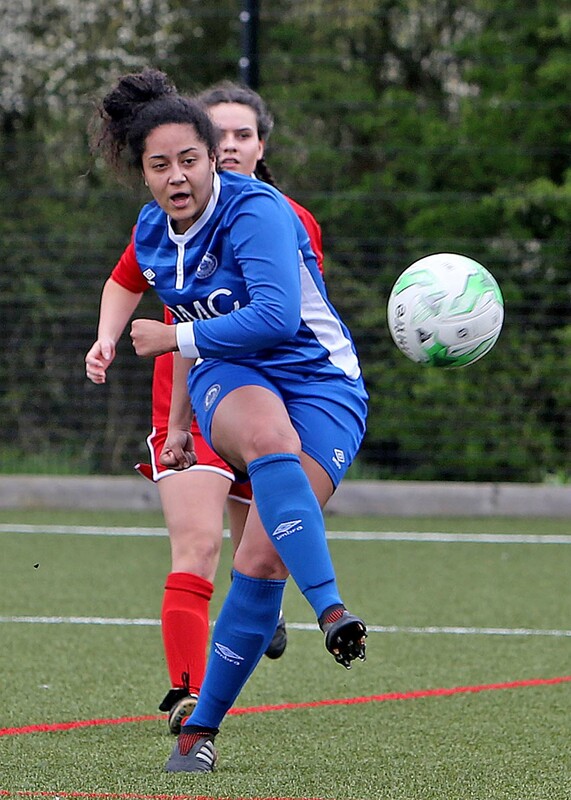 Actonian’s equaliser came after 68 minutes, in the final minutes of the game each side had the chance to secure all 3 points, Billericay were unable to convert a penalty and Actonian struck the cross bar twice, in a hard fought game score line finished in a 4-4 drawer. 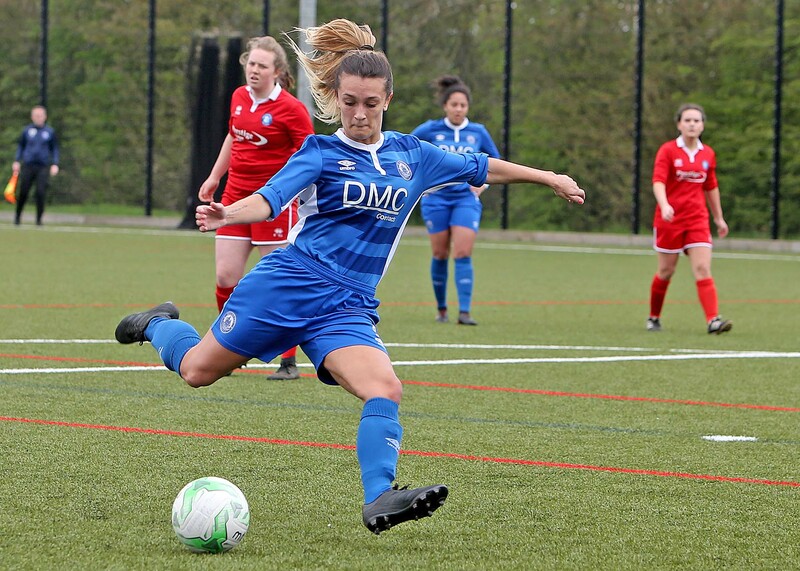 Billericay Town LFC travelled to Ipswich for their early season mid-week fixture, Ipswich started the better of the two teams and were denied by the woodwork on the 24th minute, their good work earned them a goal on the 42nd minute from a corner. 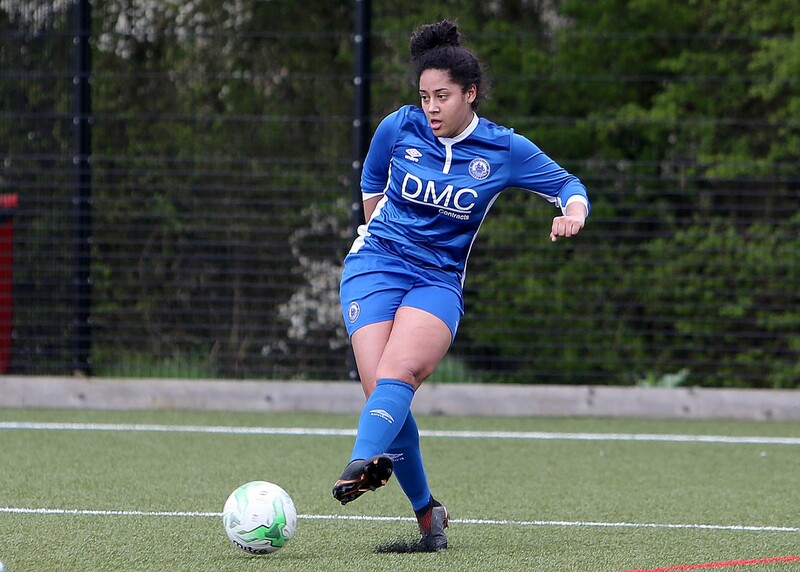 Second half saw Billericay raise the tempo but they were unable to find a break through, a Billericay defensive error on the 52nd minute saw a good long range strike beat Nikita Runnacles in goal, Billericay found themselves 2-0 down. 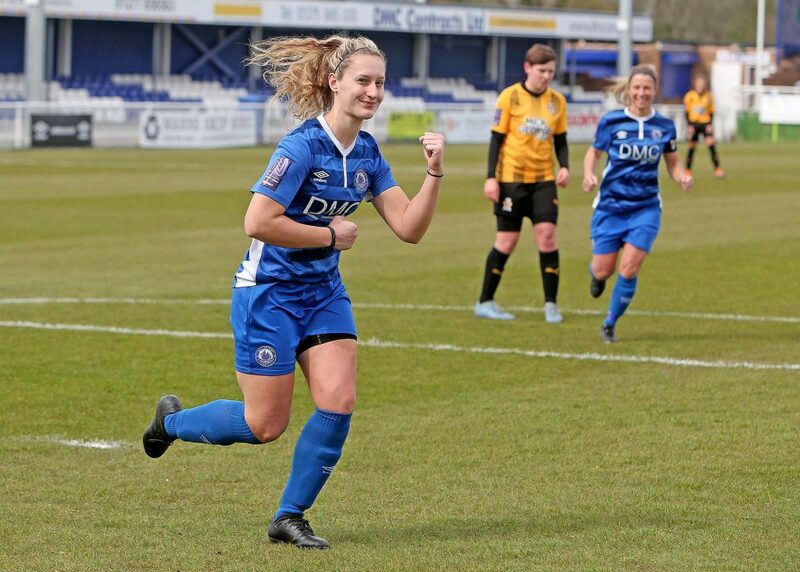 Chances were being created at both ends, Sophie Vale was unlucky to see her shot smash off Ipswich post on the 87th minute, Ipswich last ditch defending denied Billericay getting anything out of the game. Team Runnacles, Lumley (Farmer), Dougal, Jiggens, Lancaster(K.Smith), Morgan, Blackie, Butler(Vale), Box, Rushen, Jones. Sub not used Rains. 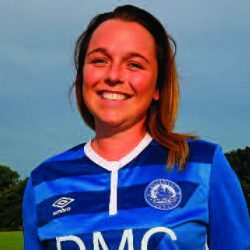 Kim Coster, Manager, game of 2 halves, Ipswich were dominant in the first half but we got back into the game in the second but it just wasn’t our night we move onto Sunday where we travel away in the WFA Cup 3rd Qualifier to Wymondham, 2pm KO. 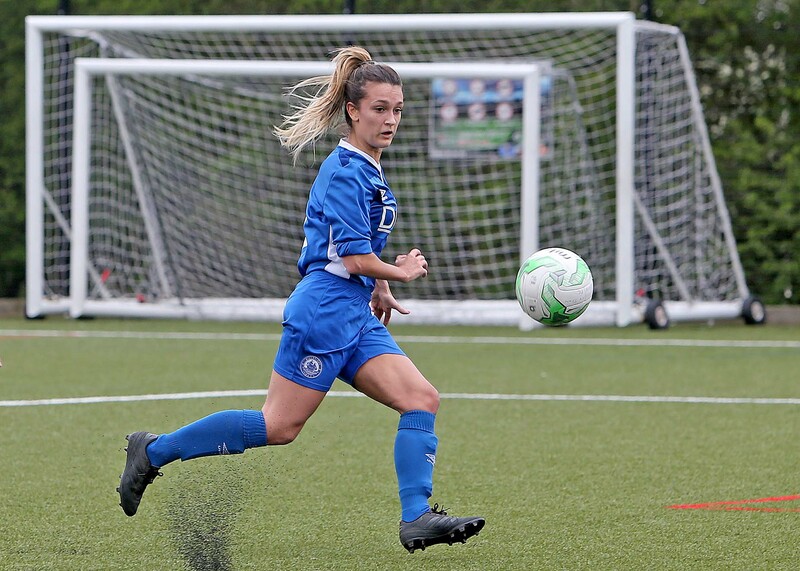 Billericay travelled to ERWFL side Wymondham and it turned out to be a fantastic game for the neutral, Billericay were 2-0 up within 20 minutes, Jay Blackie heading home from a corner on the 14th minute and Zoe Rushen from a free kick on the edge of the box on the 18th minute. 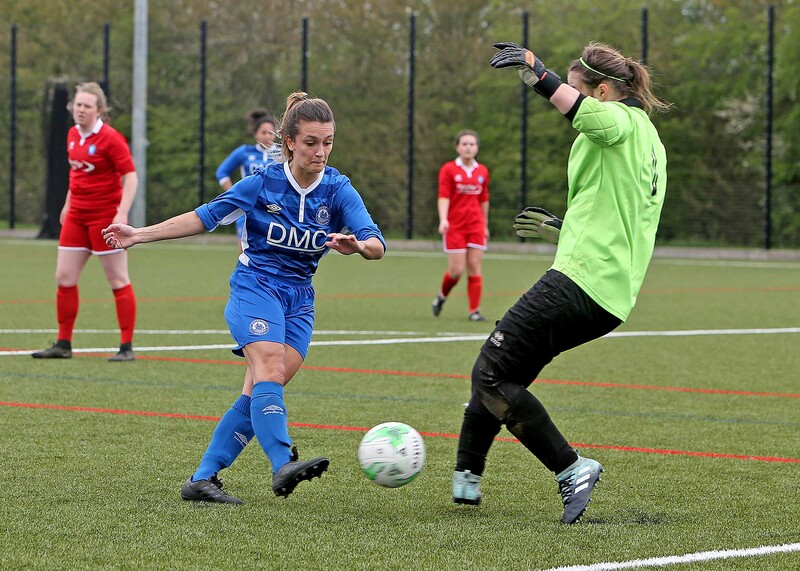 However the game changed on the 40th minute when Alex Baker playing in goal was red carded for a player clash in the box, Nicole farmer took over the keeper shirt and found her first touch was picking the ball out of the net from the subsequent penalty kick. 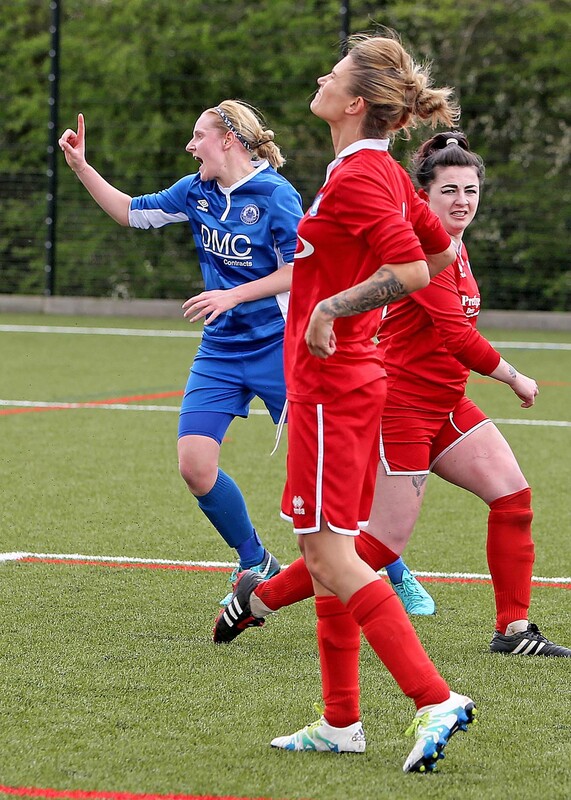 Wymondham equalised just before half time with a long range shot that beat Farmer. The Second half both teams competing well with Georgia Box and Nancy Butler going close for Billericay and a Wymondham strike hitting the top of the net. 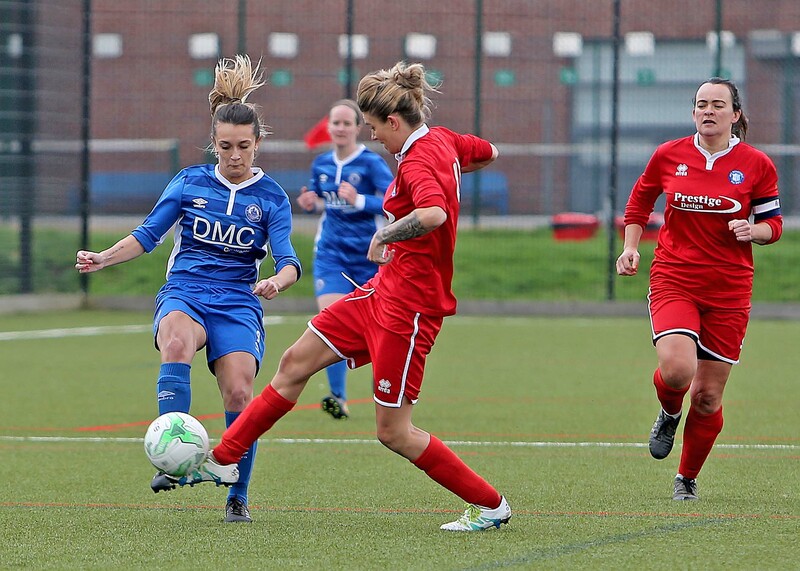 Wymondham edged in front on the 68th minute making it 3-2. 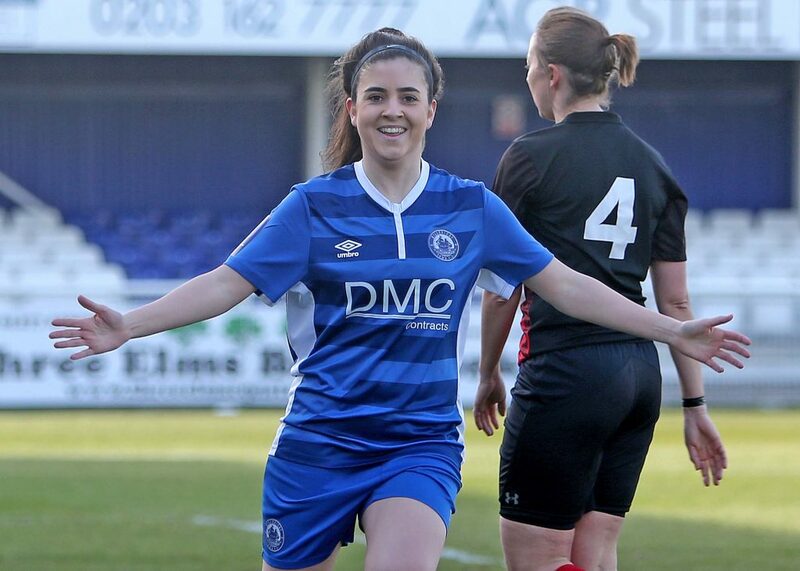 Billericay’s ten players showed really character when Lindsey Morgan scored with a looping header that beat the keeper on the 80the minute to bring the score line to 3-3. 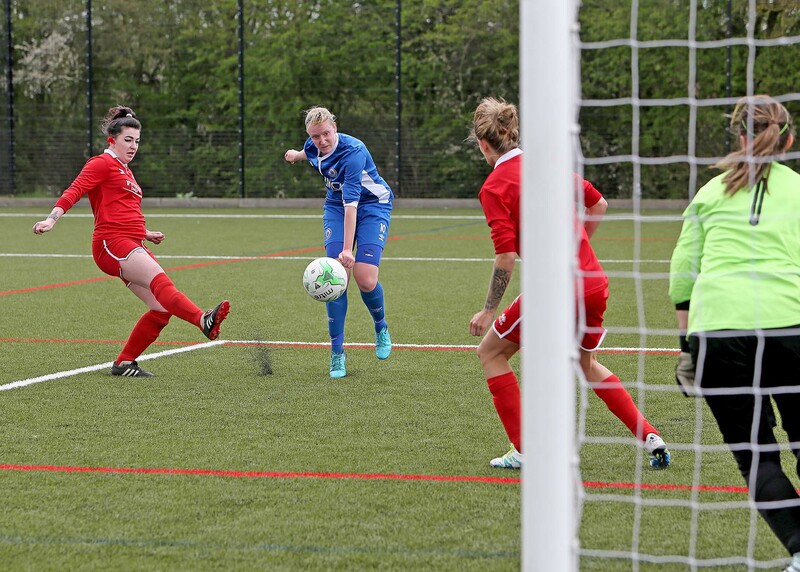 With both teams pushing for another goal, Courtney Lumley played the long ball into the home box and Rushen made sure the ball crossed the line 3-4. 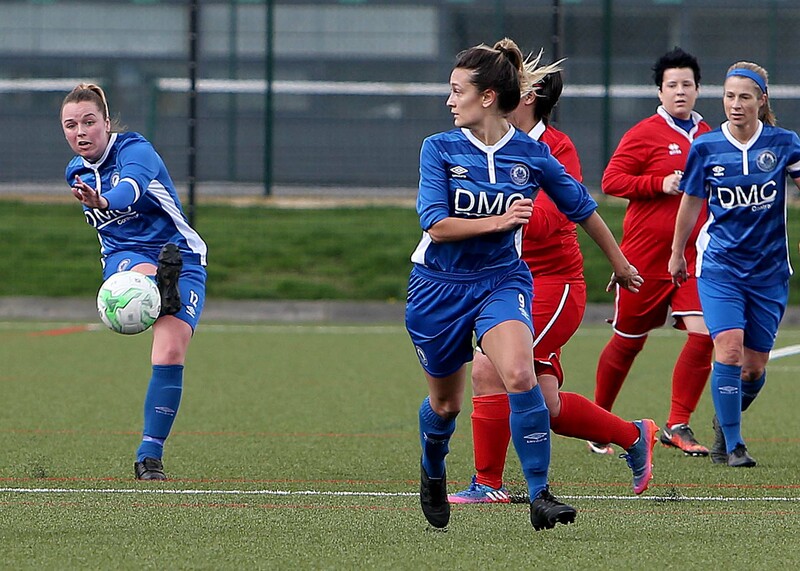 Billericay remained composed at the back and were pleased to get through to the next round. Team Baker, Lumley, Farmer, Lancaster (Rains), jones, Morgan (1), Rushen (2), Blackie (1), Box, Butler,(K.Smith) Vale (Kelly). 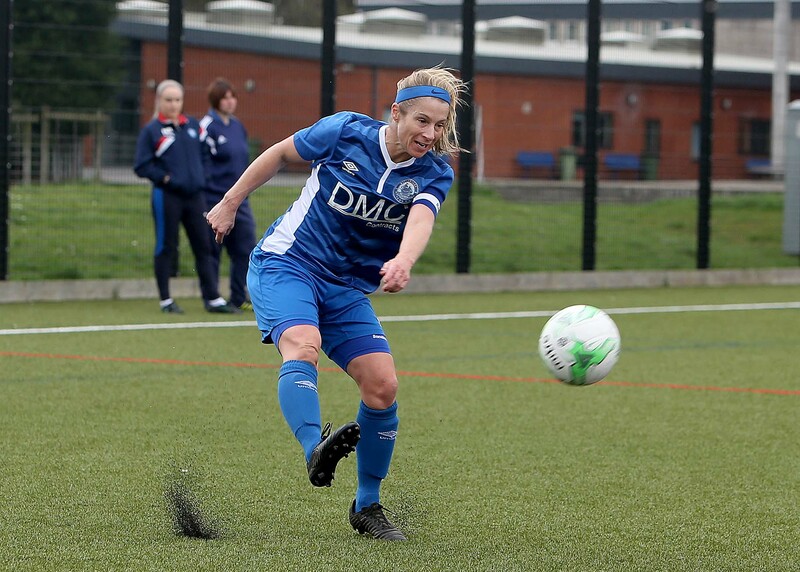 Kim Coster, The team showed great character today and I am massively proud of them all, they never gave up and deserved the result, we have been drawn away to Norwich in the first round proper. 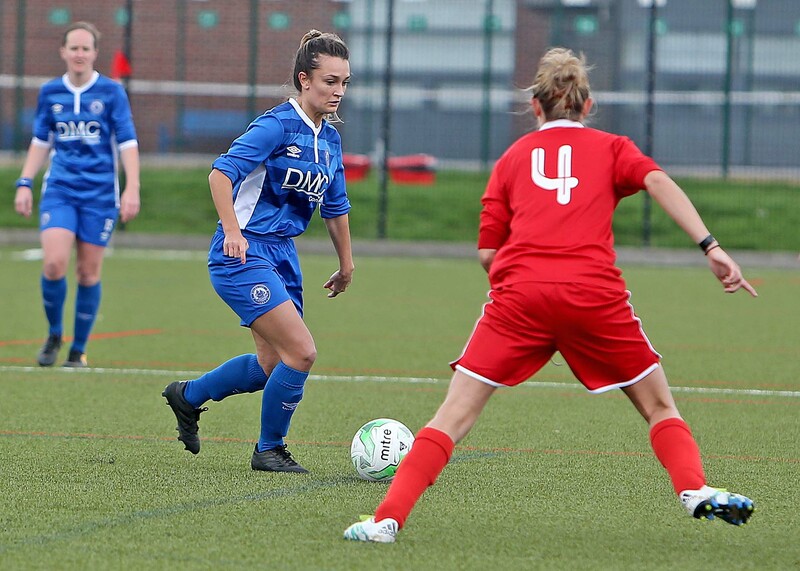 Billericay entertained Chichester City Ladies at the AGP in the 2nd round of the league cup, it was an entertaining first half with both teams playing good football, Billericay matched the higher placed opposition all over the pitch and the score line remained 0-0 at half time. 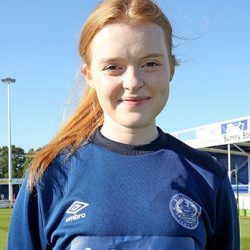 Second half Chichester started the half well and on a counter attack hit the home cross bar on the 55th minute, Nikita Runnacle’s in goal for Billericay pulled off 2 fantastic saves on the 64th minute to deny Chichester an opener, Zoe Rushen saw her long range shot at the other end of the pitch ping off the cross bar on the 65th minute. 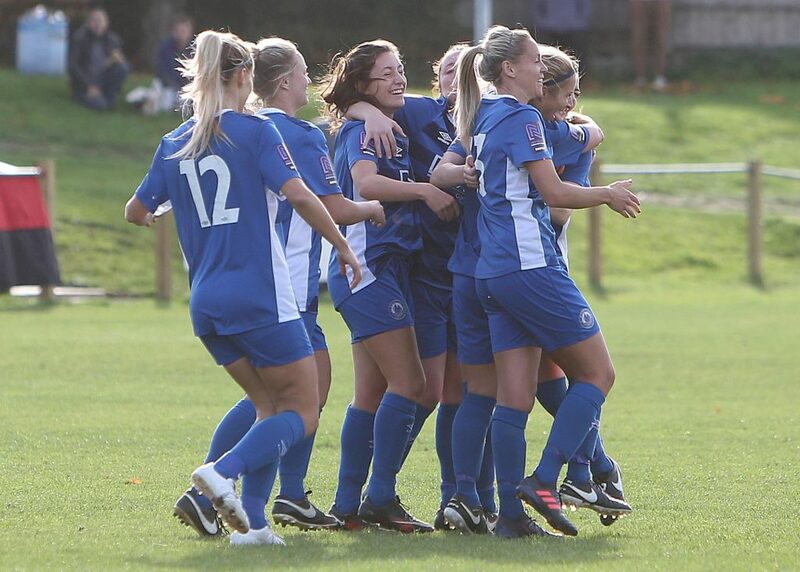 Chichester scored both of their goals in the last 10 minutes of the game. Squad Runacle’s, Lumley, Jiggens, Dougal, Farmer, Morgan, Rushen, Blackie, Lancaster, Jones (Steffanou)(K.Smith), Box(Kelly), subs not used Butler, Vale. 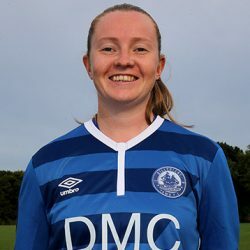 Kim Coster, Manager, So proud of the team today they put in a great performance against a very strong Chichester City side, we matched them for 80 minutes before conceding, we wish Chichester City good luck in the next round, we are back in league action on Sunday 21st October at home against Enfield Ladies. 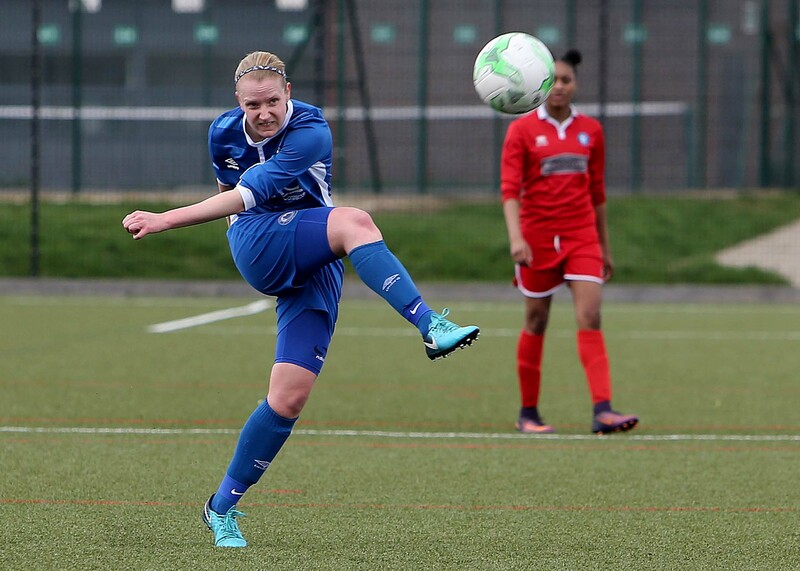 Billericay Town LFC entertained Enfield LFC at the AGP in the FA Women’s national League, SE Division 1 and what a thriller it turned into. 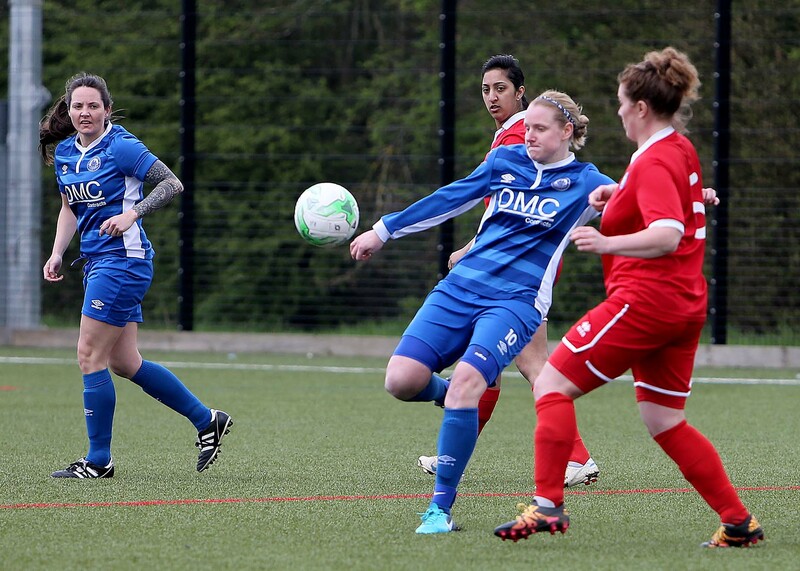 Both teams created chances from kick off but Enfield opened the scoring on the 17th minute 0-1. 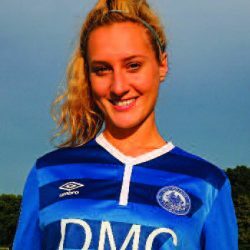 It didn’t take long for Billericay to equalise, good build up from midfield saw Zoe Rushen beat the keeper 1-1 on the 39th minute. 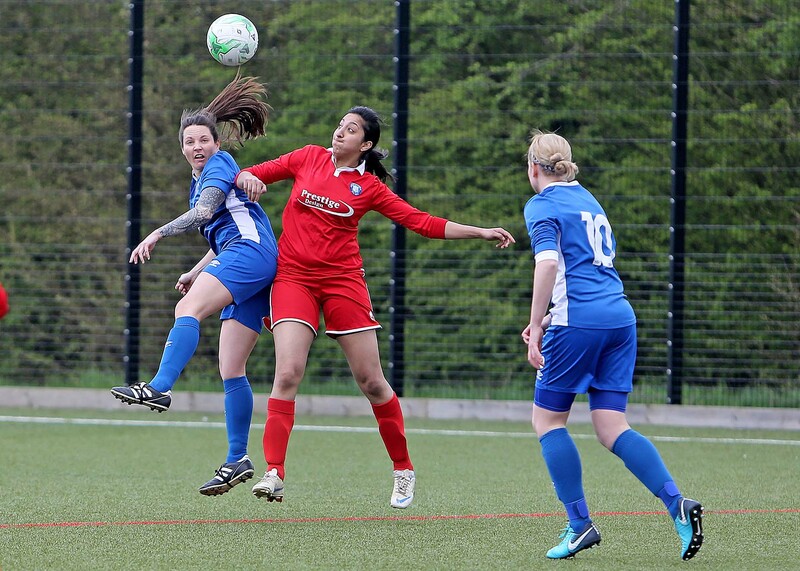 The game was entertaining with both teams playing good football, Enfield capitalised on a defensive error and made it 1-2 on the 42nd minute. 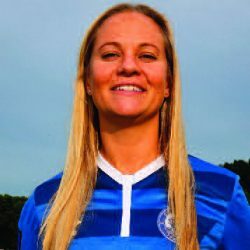 Immediately from the retake Billericay broke into the Enfield half, Georgia Box pressed the Enfield full back whose back pass to the keeper was intercepted by Rushen who made it 2-2 on the 43rd minute. 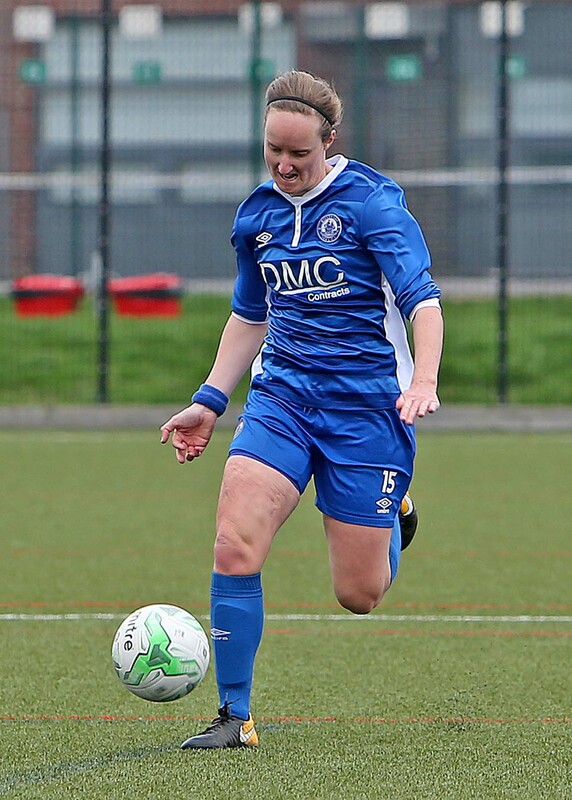 With the last few minutes of the half remaining Rushen scored her third of the afternoon again through good link up play from Billericay 3-2 on the 4th minute. Second half was just as entertaining it was good to see two good footballing sides not just playing the long ball, Billericay held their nerve and game finished 3-2. 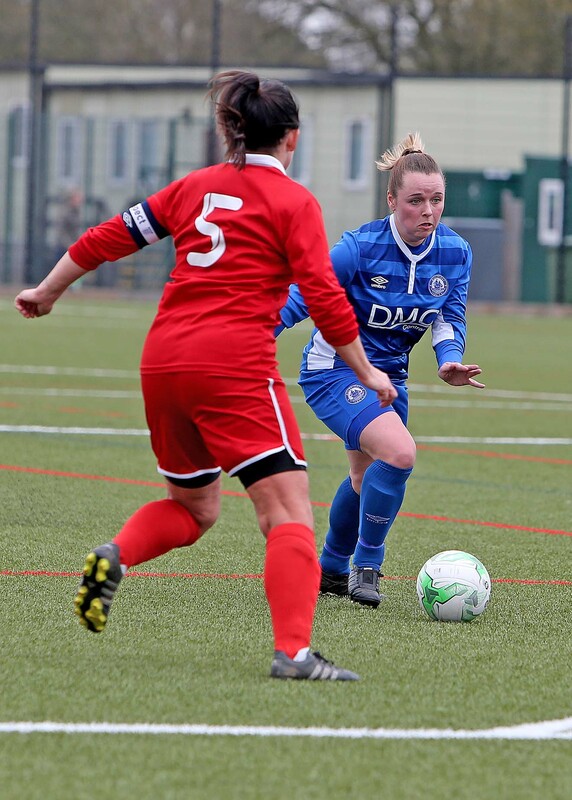 Kim Coster, Manager – Another good performance from the team that secured all 3 points against a very young strong Enfield side, it was good to see both teams playing good football. 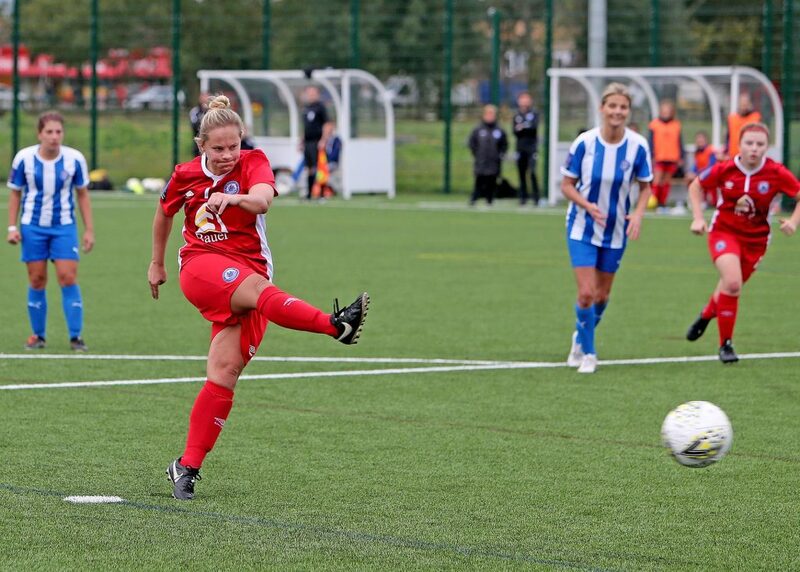 Next fixture is on Sunday November the 4th at the AGP 2pm KO where we host Crawley Wasps. 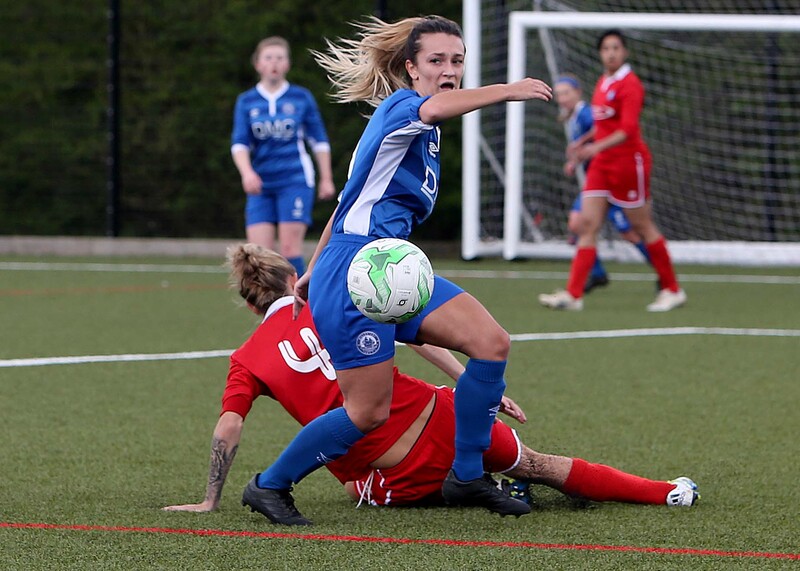 Top of the table clash saw Billericay host Crawley Wasps at the AGP, first half saw both teams play good football but unable to break the dead lock remained 0-0. Second half the game opened up and Crawley got in front on approx. the 70th minute, with Billericay looking for an equaliser Wasps made it 2 on the 80th, Billericay were unable to get back into the game and Crawley secured the important 3 points. 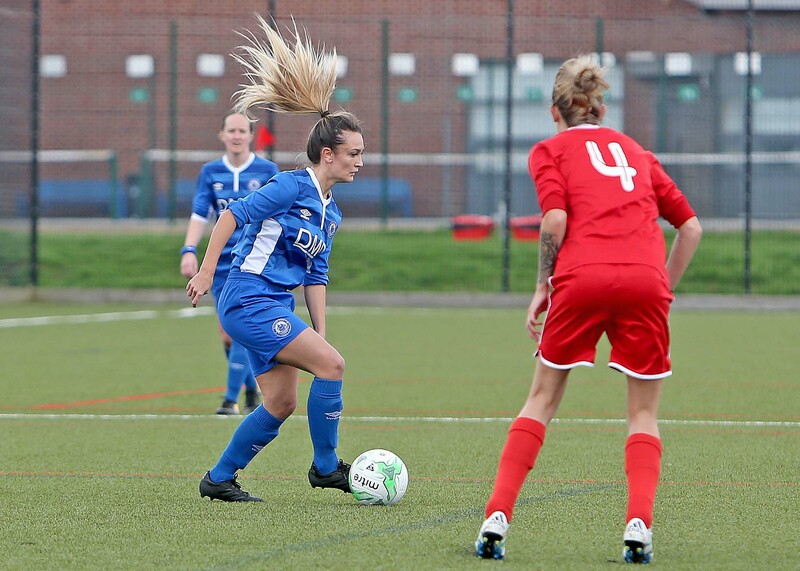 Squad Runnacles, Dougal, Lancaster (Nash), Jiggins, Lumley, Jones, Morgan, Rushen, Blackie, Rodmey (P.Smith, Box (Butler), subs not used Farmet, Stephanou. 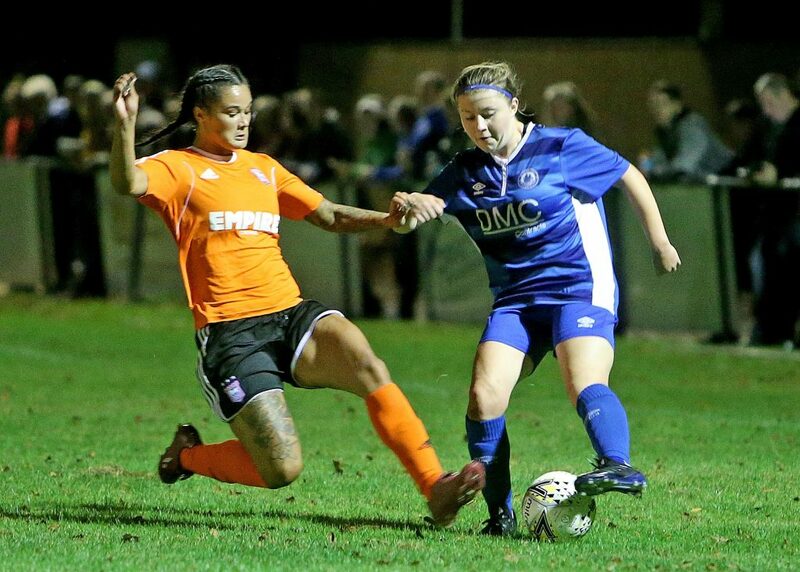 Billericay Town LFC secured a place in the 3rd round proper of the SSE Women’s FA cup after beating Luton Town LFC 3-1 AET. 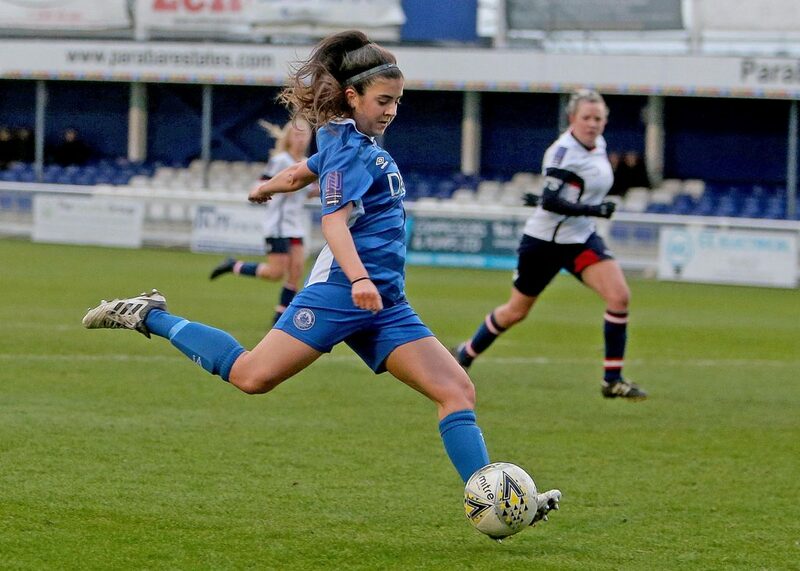 Luton scored first and made Billericay work hard for the equaliser, this came on the 64th minute from Karen Steffanou, the game played out 1-1 and set up for extra time, substitute Broghan kelly made an immediate impact when she lobbed the keeper making it 2-1, Billericay secured the win from a good move started Nancy Butler she played a ball through to Jay Blackie whose run into the box saw her beat the defender and the keeper and calmly pass the ball into the empty net. 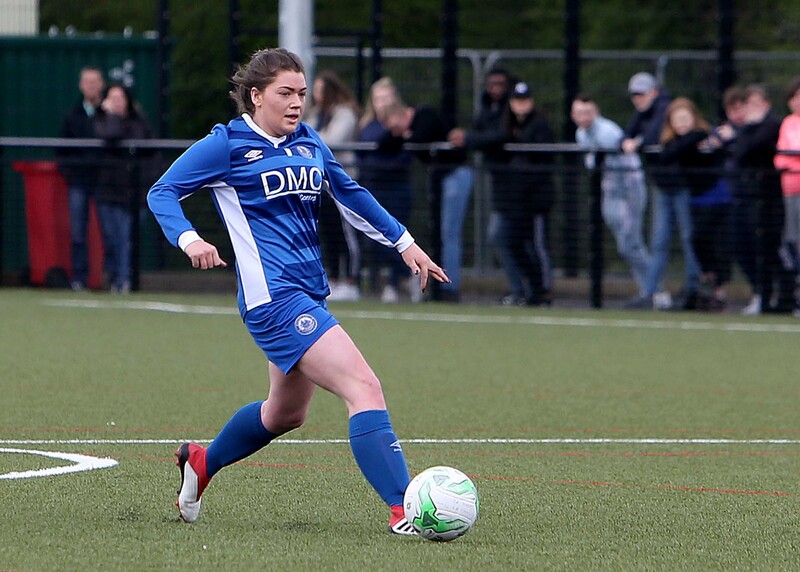 Kim Coster Manager, the ladies have made history today, this is the furthest the club has progressed in the cup, 3 well taken goals secures a place in the next round against Loughborough Foxes to be played at the AGP Arena 1pm KO. 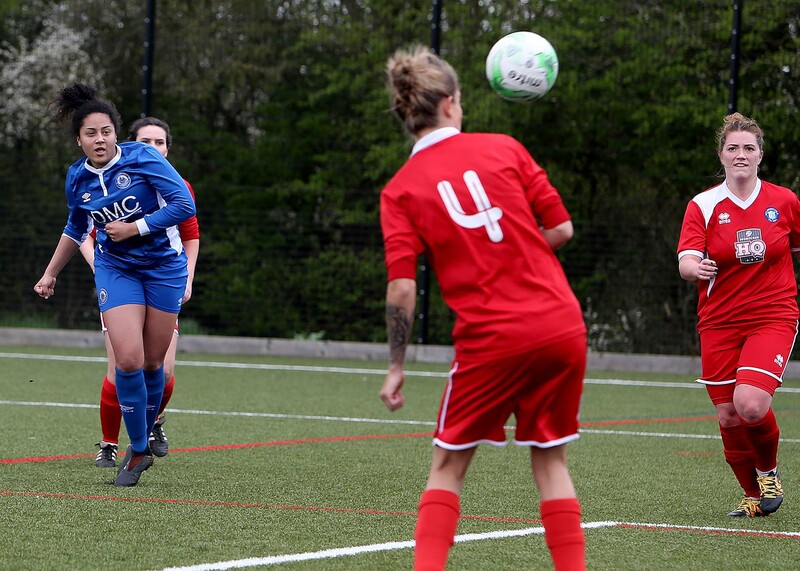 Ladies hosted Loughborough Foxes in the SSE Womens FA Cup and bowed out 3-4, after a hard fought tie which saw the higher placed team secure a place in the next round. 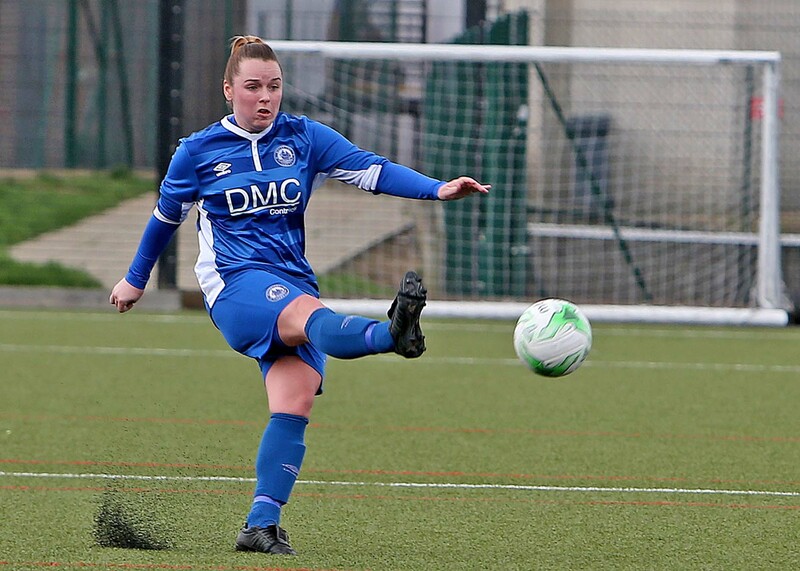 Billericay started well with a Sam Pittock scoring a worldie of a goal on the 6th minute, Loughborough equalised within minutes from a free kick on the 8th, Loughborough made it 2 on the 10th minute and 3 on the 36th minute when Billericay didn’t clear from a corner. 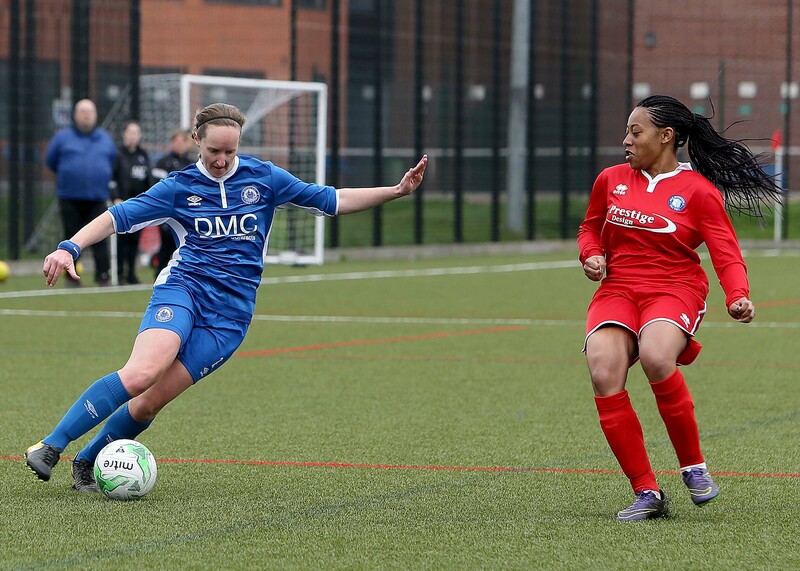 Second half saw Loughborough increase the lead by making it 4 on approx. 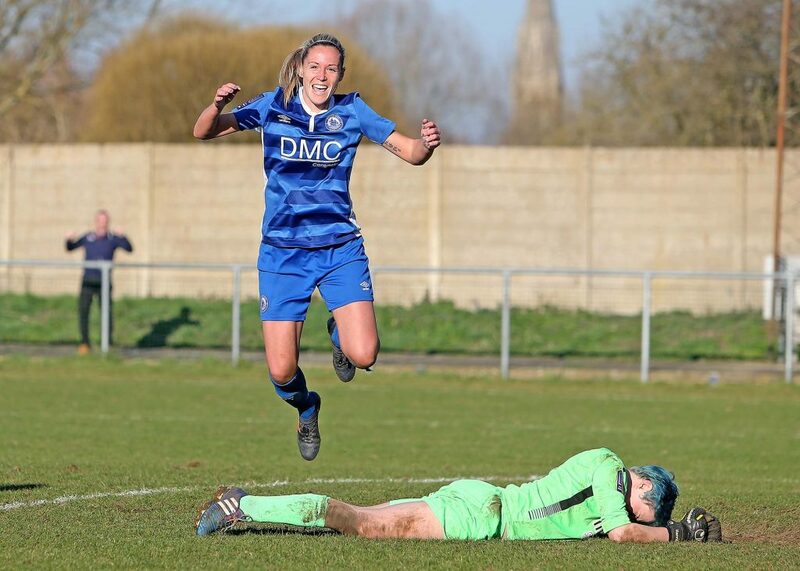 the 62nd minute, with all thinking the game was over Billericay pulled one back on the 77th minute, Zoe Rushen from a corner, this spurred Billericay on and Zoe Rushen made it 3 on the 82nd minute, Billericay created a number of chances in the final minute but good goal keeping denied them the equaliser and taking the tie into extra time. 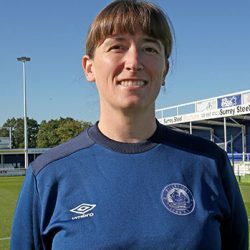 Kim Coster, Manager, what a cup run which is great for the ladies and for the club, Loughborough were professional in their play but we created chances that on another day would have gone our way, the last 15 minutes was a testament to the squad a real cup battle we wish Loughborough well in the next round, we are back in league action on Sunday 13th when we host Denham Ladies, 2pm KO at the AGP. 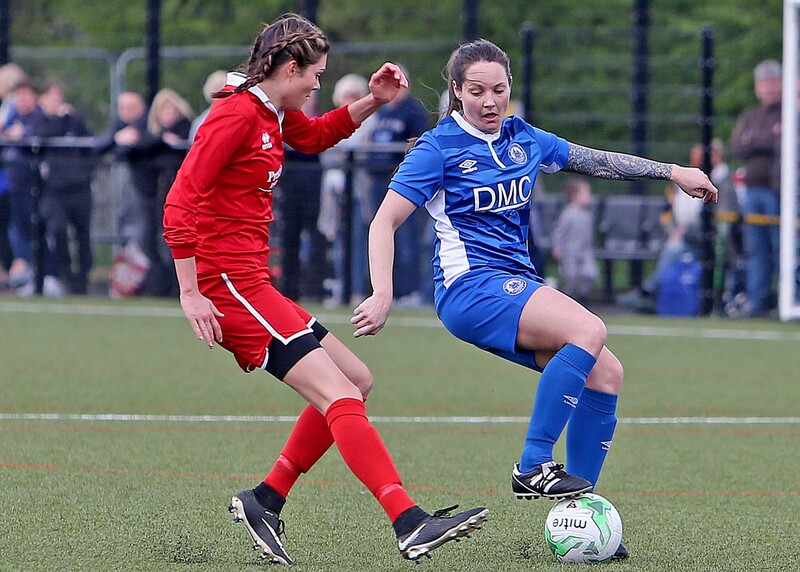 Squad Baker, Lancaster(Farmer), Dougal, Jiggins (Lumley), Jones, Blackie (Butler), Rushen (2), Morgan, Rodney, Pittock (1), Stephanou, subs not used Keates, K. Smith, Vale, Kelly. 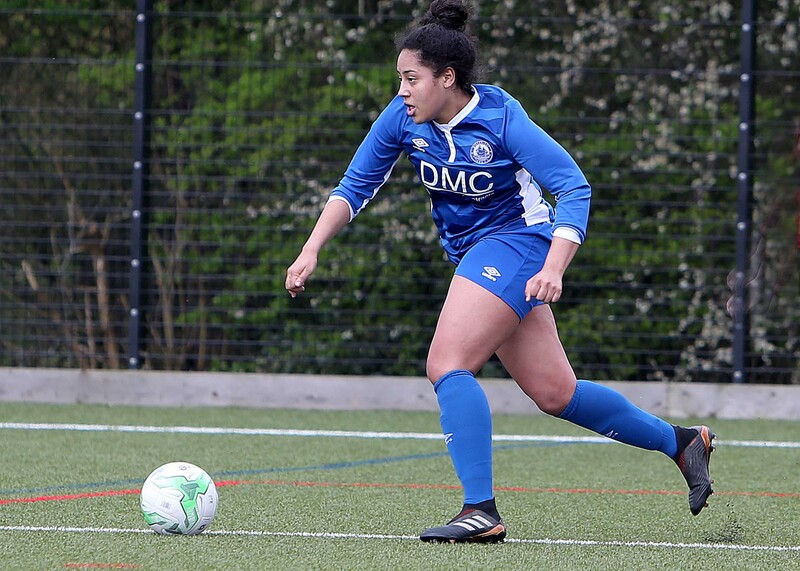 A strong team performance against Denham United LFC saw Billericay run out 6-0 winners. Billericay had a great start to the game and scored the first of the afternoon on the 9th minute, Jay Blackie heads home from a corner. 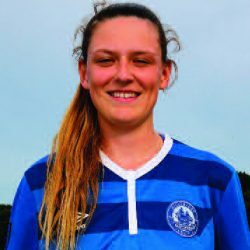 Good link up play saw Esme Lancaster beat the visiting keeper 2-0 on the 39th minute, Billericay thought they had made it 3 just before half time after a strike from Karissa Rodney only to see a covering defender clear the ball off the line. Second half, Billericay continued their fine form and Lancaster got her brace on the 47th minute, Billericay kept up the pressure and Blackie scored her brace a great strike on the 55th minute, Billericay were enjoying lots of procession, the hard working Lindsey Morgan in midfield was involved in the 5th, her pass to Rodney into the box was cleverly set back to Sophie Vale whose shot hit the back of the net. 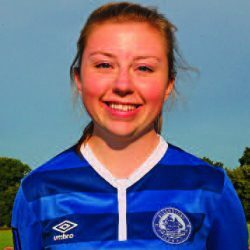 Danica Dougal scored the 6th with a 60 yard free kick that beat the keeper into the bottom right hand corner of the net. 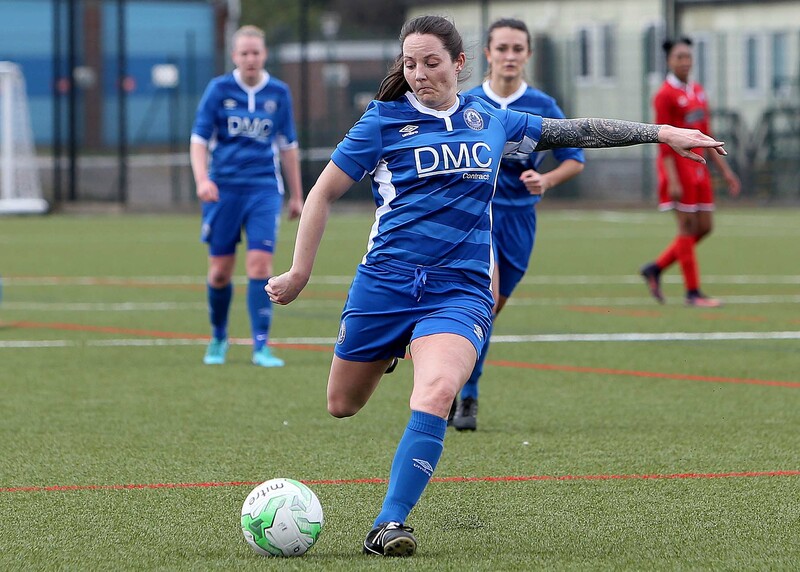 Billericay Town Ladies FC secured a place in the semi-final of The Women’s Essex County Cup after beating Rayleigh Town Ladies FC, 31-0 at the AGP Arena on Sunday. 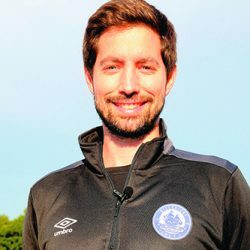 Billericay had a good start with an early goal from Sam Pittuck, the experience between the 2 teams was evident but Rayleigh never gave and were a credit to their Manager and Club, Billericay are 4 divisions higher then Rayleigh Town and this reflected in the final result. 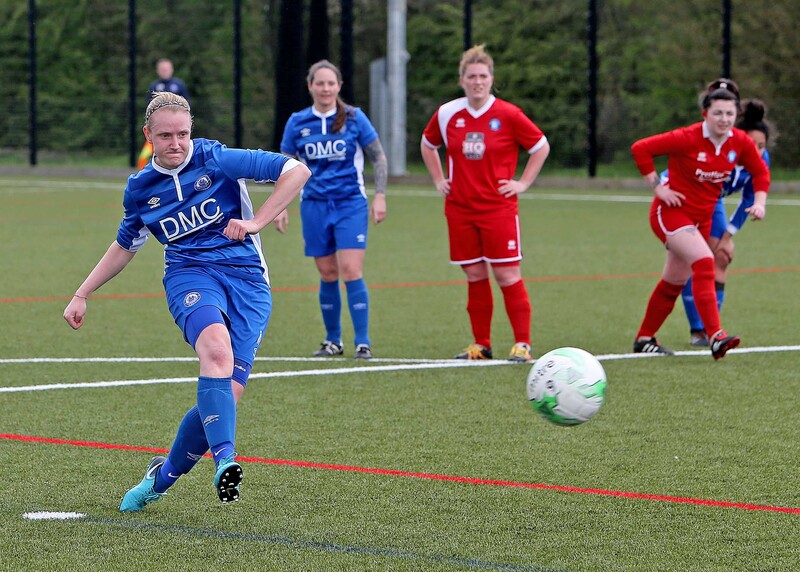 Squad, Baker, Farmer, Lumley, Jones (Lancaster)(2), Dougal (1), (Jiggens), Morgan (2), Stephanou, Blackie (3), Rushen (8), Pittock (8), Rodney (5), (Smith)(2). 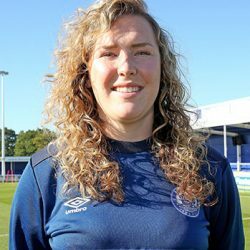 Kim Coster, Manager, I am pleased that we are through to the semi-final as the ladies were extremely professional in their play today, Rayleigh never gave up they are young team and very talented, the experience was the difference on the day, we face Brentwood Ladies at the AGP in 17th February 2019, 1.30pm KO. 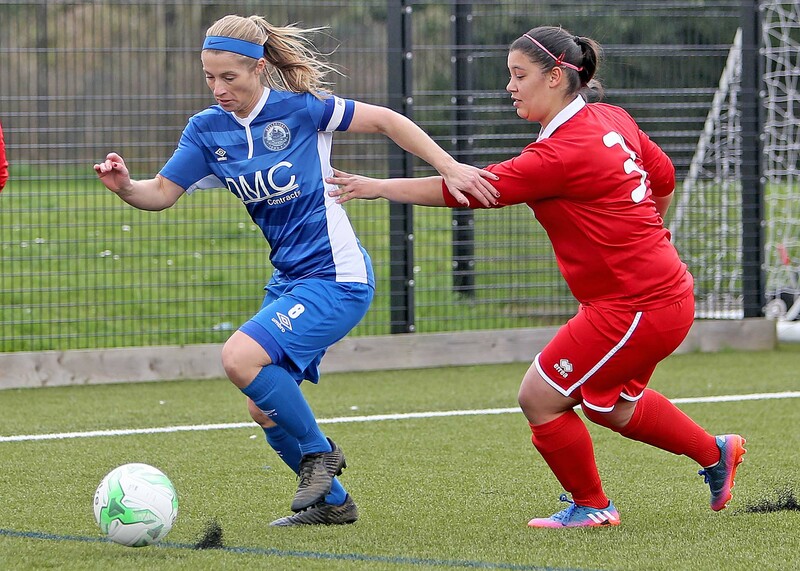 Billericay travelled to Enfield Town Ladies and shared the spoils with a 2-2 draw on Sunday. 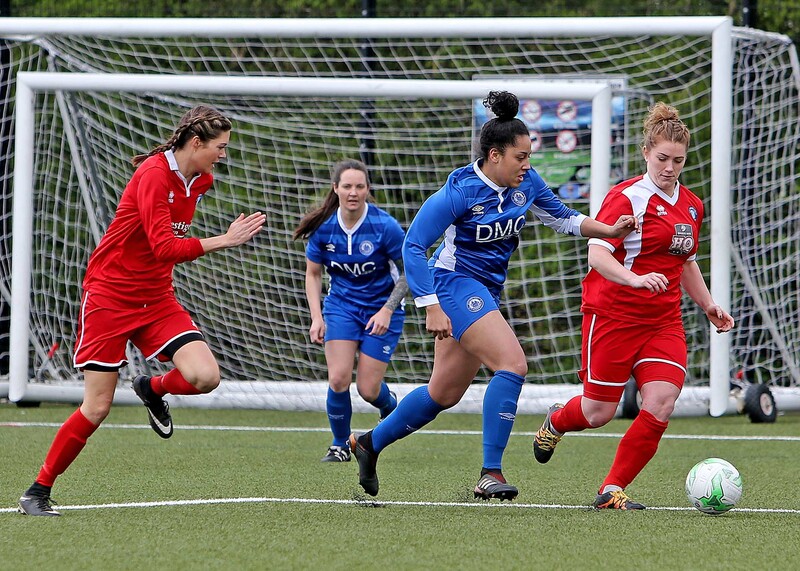 It was a tough game on a heavy pitch, Enfield got in front on the 48th minute, Jay Blackie equalised on the 57th minute from a corner. 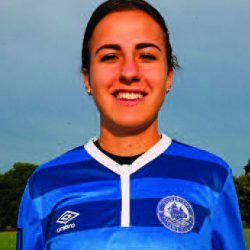 Lindsey Morgan scored for Billericay on the 62nd minute this was a turning point in the game with heavy tackles being made from both sides, Enfield was awarded a free kick in Billericay’s half on the 81st, Billericay were unable to clear allowing Enfield the equaliser. 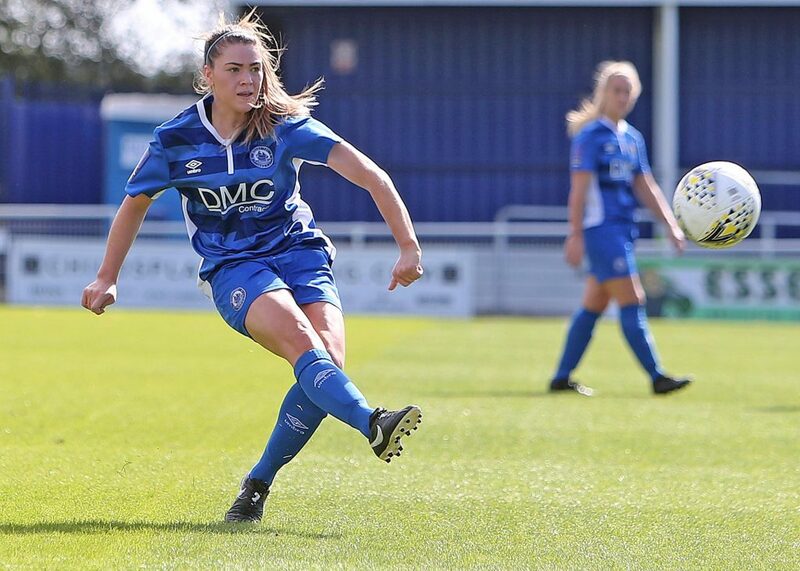 Billericay secured another 3 points on Wednesday Night at the AGP after a good 2-1 win against Leyton Orient, both goals scored by Zoe Rushen and some big saves from Alex Baker denied Leyton from getting anything from the game. 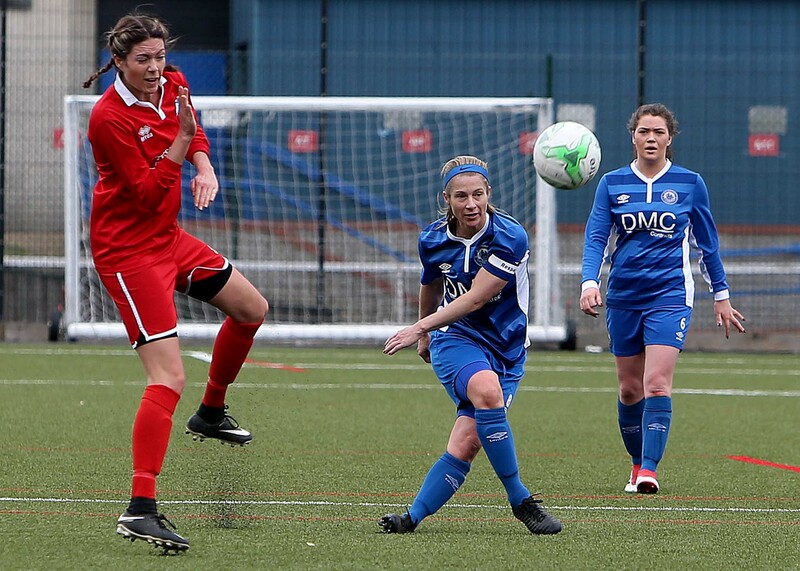 Billericay edged in front on the 22nd minute, Rushen shot from a tight angle beating the keeper, within minutes Baker was called upon to deny Leyton, second half Leyton equalised on the 65th minute, a neat flick on from a corner, Billericay were awarded a free kick on the 72nd minute, Lucy Jones took and floated the ball high into Leyton’s penalty area, the goal keeper didn’t deal and Rushen fired home. Billericay managed the game through to the final whistle. 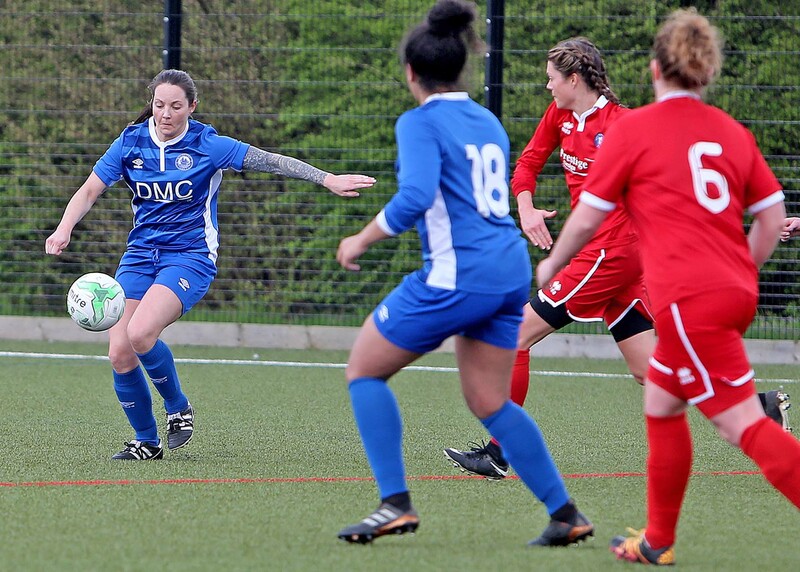 Kim Coster, Manager, delighted to get the win against a good Leyton Orient side, we bounced back from the draw against Enfield on Sunday, this was a good 3 points secured, we now focus on our Essex County Cup semi-final on Sunday against Brentwood Town LFC, at the AGP Arena with a 1.30pm KO. 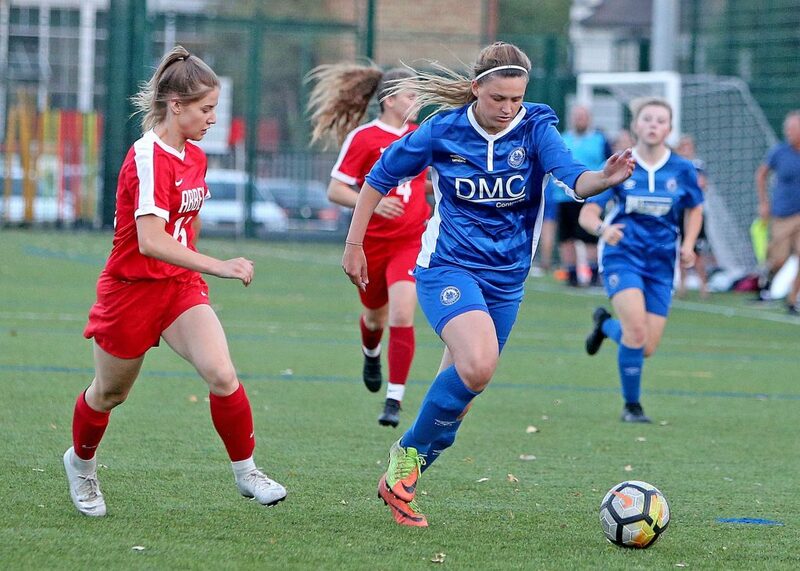 Billericay Town LFC entertained Brentwood Town Ladies in the Women’s Essex County Cup, at the AGP Arena on Sunday and secured a place in the final, 4 goals for captain Lindsey Morgan, 1 a peice for Zoe Rushen and Kerry Stimson, and a brace for substitute Sophie Vale. 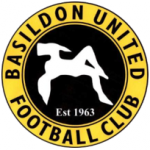 They now face C&K Basildon on the 18th April at Bowers & Pitsea, 7.45pm KO after they beat Hutton 5-1. 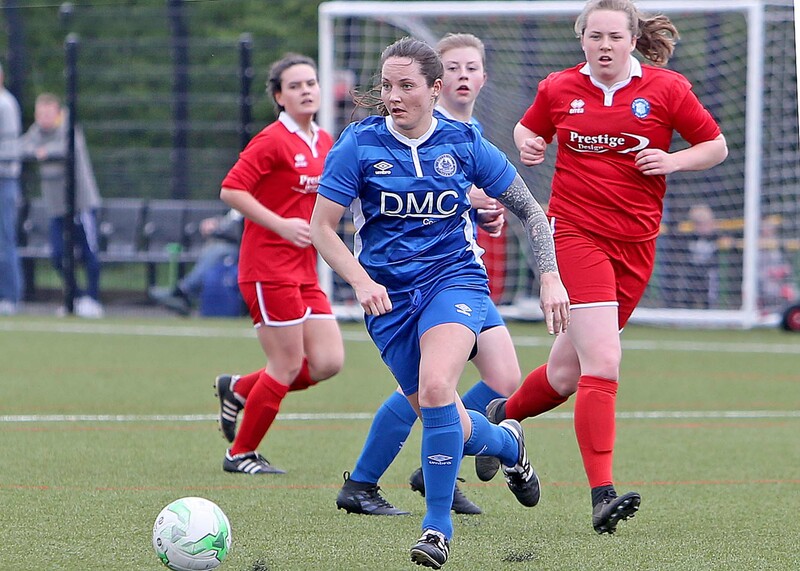 Kim Coster, Manager, was delighted for the team to be in the final, the players knew what they needed to do and were rewarded with 8 good goals, Brentwood started the better of the 2 teams but we were patient in our play, Brentwood battled to the final whistle. 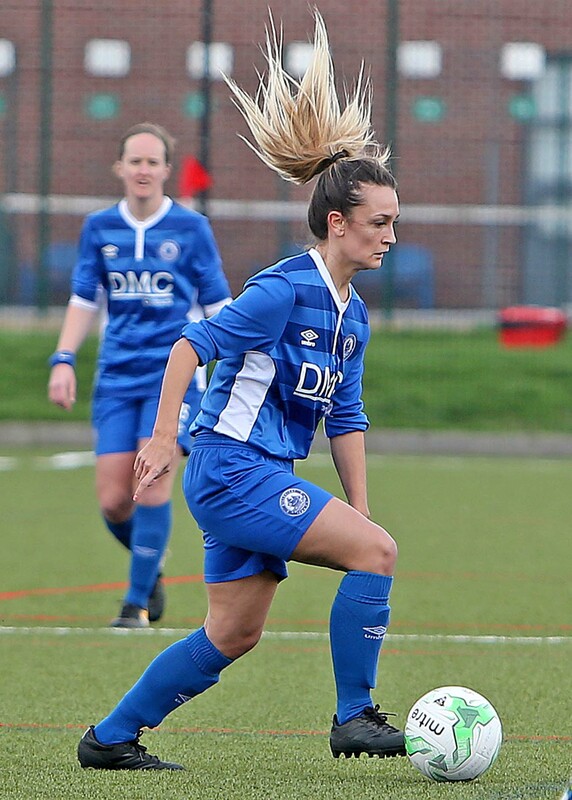 Squad Baker (Rains), Lumley, Jones (K.Smith), Farmer, Lancaster, Stephanou, Blackie, Stimson (1), Morgan (4), Rushen (1) (Vale)(2), Pittuck, sub not used Rodney. Billericay travelled to South East London to play AFC Wimbledon, both teams like to play football so the fixture was always destined to be a good game for the neutral. 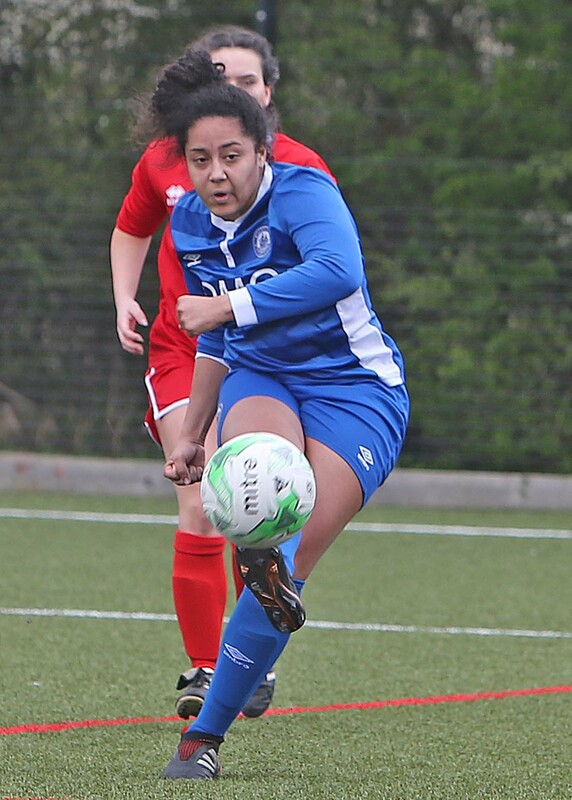 Weather conditions didn’t help either team but the best chance of the half fell to Billericay’s Karissa Rodney on the 25th minute, a great strike pinged off the post. 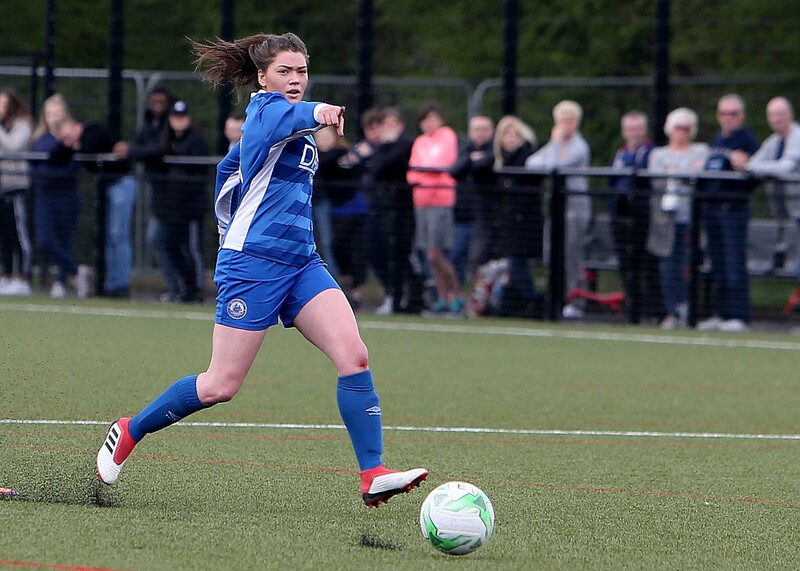 Lindsey Morgan had a decent effort just before half time which saw her shot just go wide after making a good run into the box, the half finished goaless. 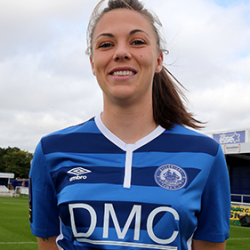 The second half saw Wimbledon’s keeper, Edie Kelly pull off a great save to deny Rodney straight from kick off. 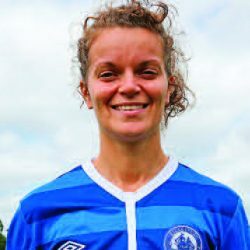 On the 51st minute against the run of play Wimbledon had a strike which was parried away by Nikita Runacles but a Wimbledon striker was first to react to the loose ball and slotted home 1-0. With Billericay pushing for an equaliser, Wimbledon on the counter punished Billericay to make it 2-0. 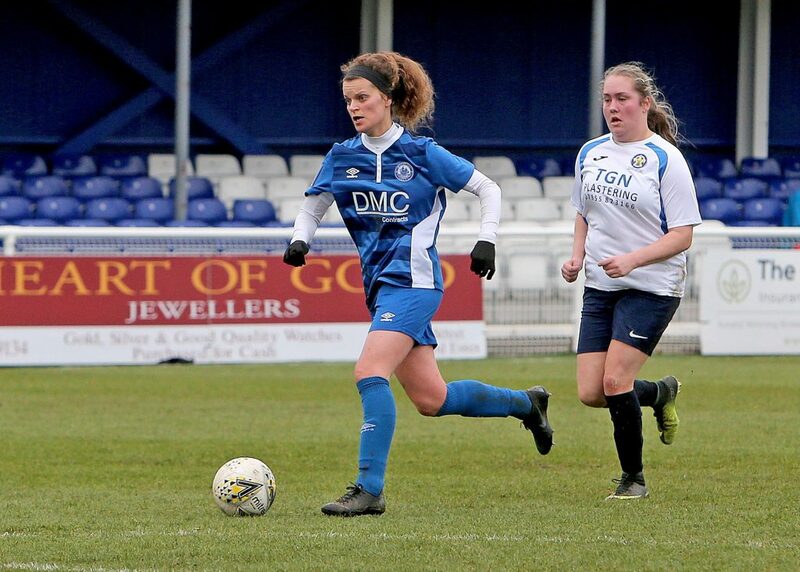 Billericay’s Lucy Jones scored a consolation goal on the 88th minute but with minutes fading Billericay run out of time to get anything from the game. 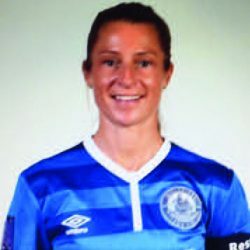 Kim Coster Manager, a good game for the neutral but a frustrating game for us, we created chances but sometimes you have to make your own luck and we under delivered today against a good Wimbledon side, we take the learnings on board and focus on Sundays home game against Actionaians with a 2pm KO at the AGP Arena 10th March. 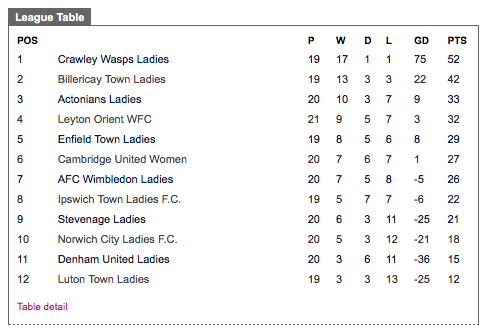 Billericay Town Ladies travelled to League leaders Crawley Wasps for the top of the table clash on Sunday. 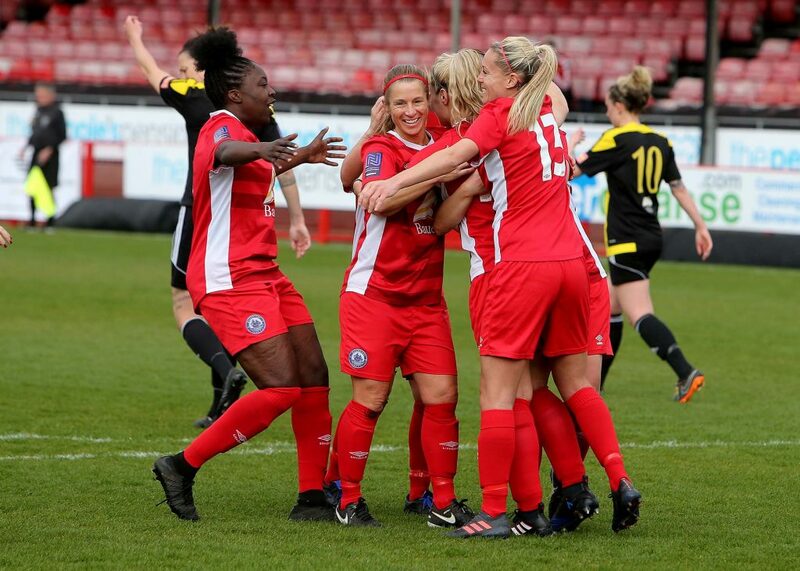 Crawley sitting top of the league unbeaten and needing just a win to clinch the FA Women’s National league Division 1 South East title, it was always set to be a good competitive match and what a game for the neutral. Billericay ‘s game plan worked a treat stopping Crawley Wasps passing and the blues pressing the ball well countered Crawley’s normal flowing movement, Crawley did have more possession of the ball but they were unable to find a break through, Billericay made the most of their ventures into the Wasps half and when a Crawley defender handled in the penalty area Danica Dougal stepped up to convincingly strike the ball making the score 0.1 to the blues at the interval. 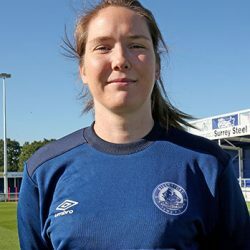 Crawley came out guns blazing in the second half and created a number of chances but Billericay defended well, Billericay’s keeper Nikita Runacle’s pulled off a number of fine saves to deny Crawley the win needed. The Game ended 0-1 to Billericay, this was a fantastic achievement as Crawley had not lost a league game for 2 years, equated to 32 games without a loss. 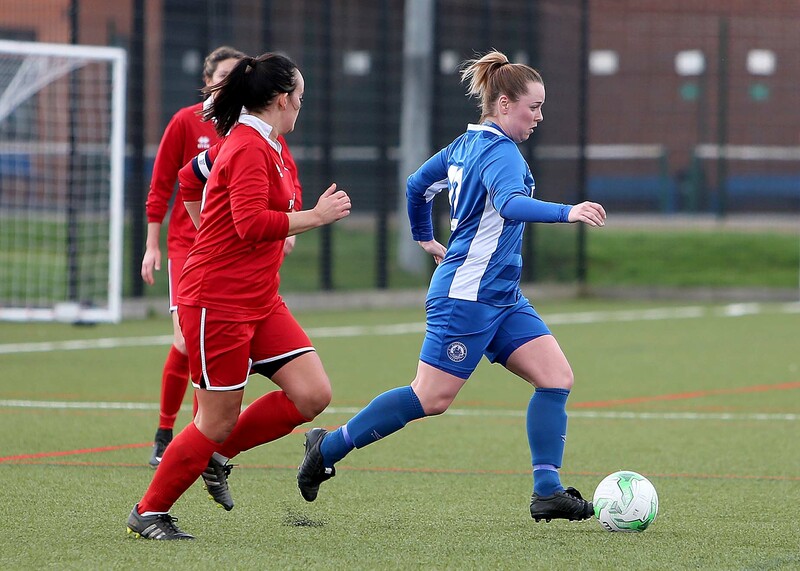 Team Runacle’s, Lumley, Dougal (1), Clarke, Morgan, Blackie (Pittuck), Stimson, Jones(Stephanou), Rodney(Famer), Rushen, Lancaster, subs not used Maria-Rains, K.Smith. 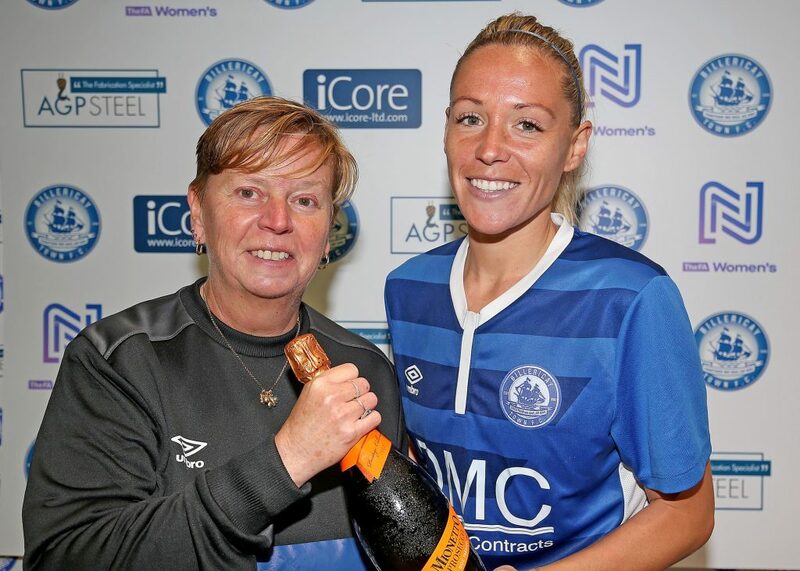 Kim Coster, Manager, wow what a result for the team and staff, the team worked extremely hard for the win, Crawley in the last 15 minutes had us defending in our own half but the team defended well and Nikita Runacle’s pulled off some top level saves to help us clinch the 3 points and deny Crawley the title on the day. 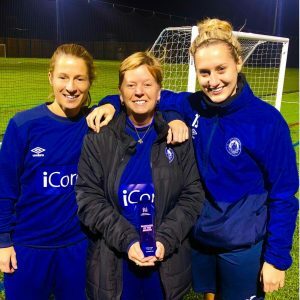 Billericay Town Ladies Manager, Kim Coster, was surprised but delighted to be nominated and awarded the October FAWNL Manager of the month, Kim narrowly missed out in September to Crawley Wasps Manager, speaking with Kim it is an honour just to be nominated but to actually win it is fantastic for all involved with the club, the ladies are doing well after being promoted at the end of last season and are currently sitting second in the league behind Crawley, on Sunday they made club history by beating Norwich City Ladies in the 1st round proper of the Women’s FA Cup, it turned out to be a thriller of a game, 4 red cards and both teams playing extra time with 9 players. 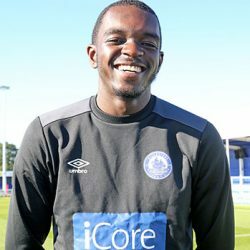 Billericay secured the win with a Georgia Box late winner they have been drawn at home against Luton Town the game will be played at the AGP Arena on the 2nd December, 1pm KO.